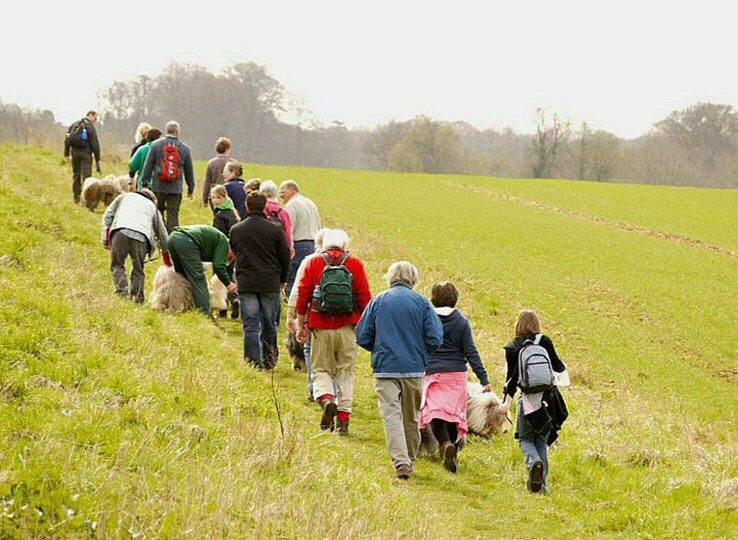 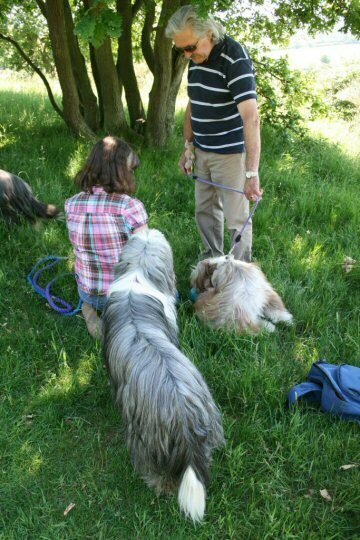 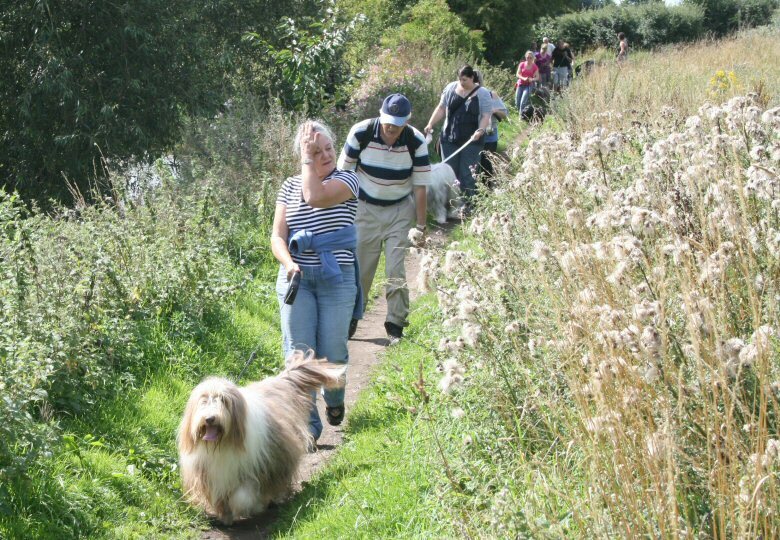 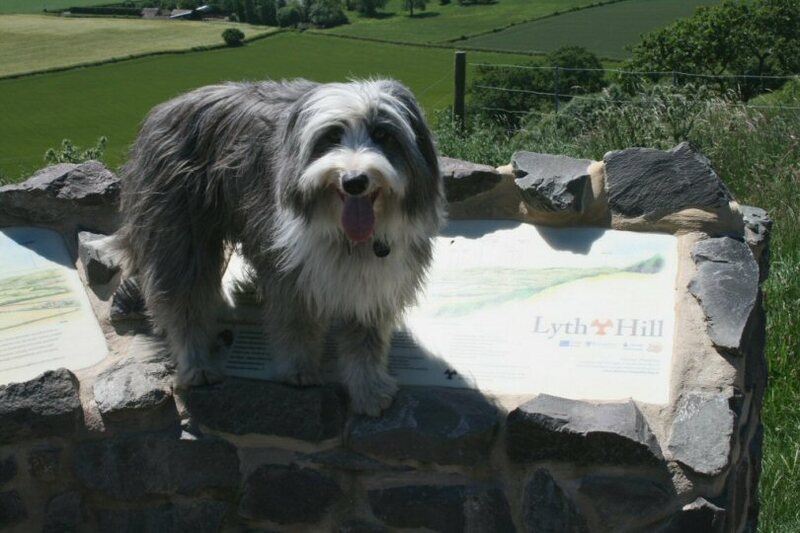 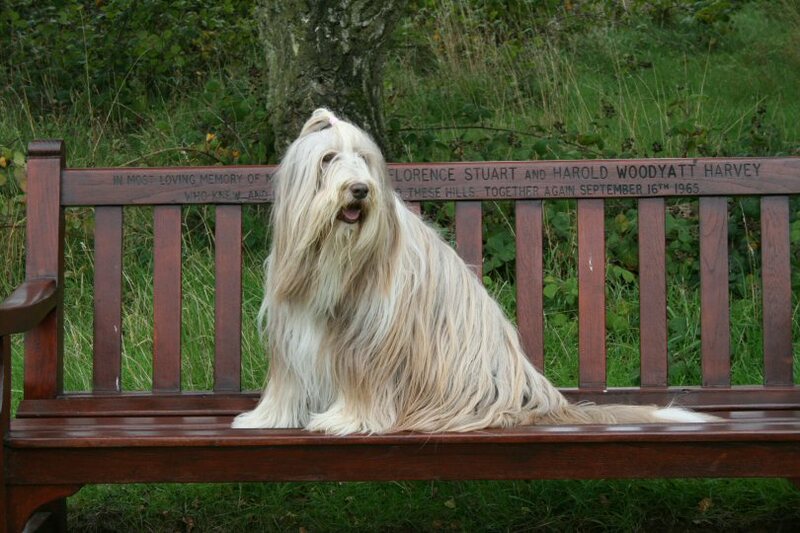 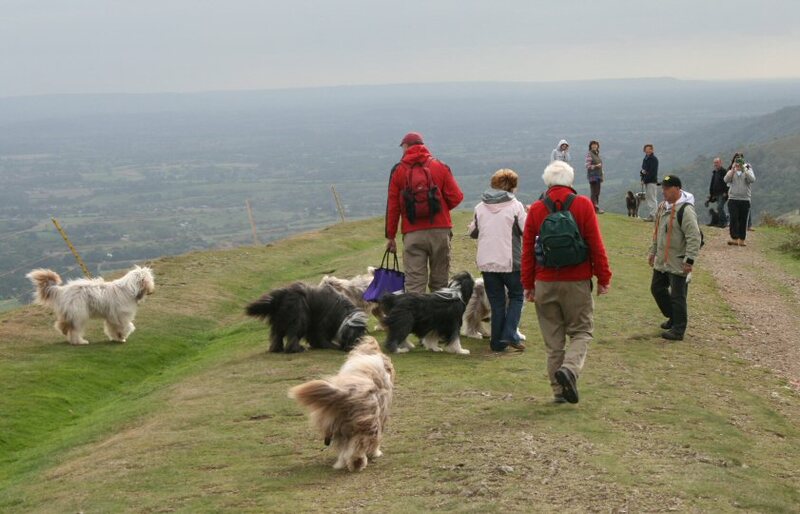 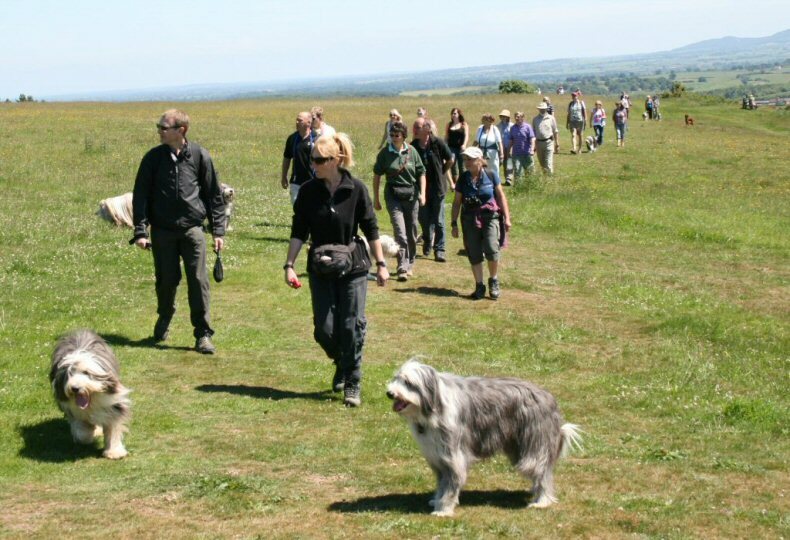 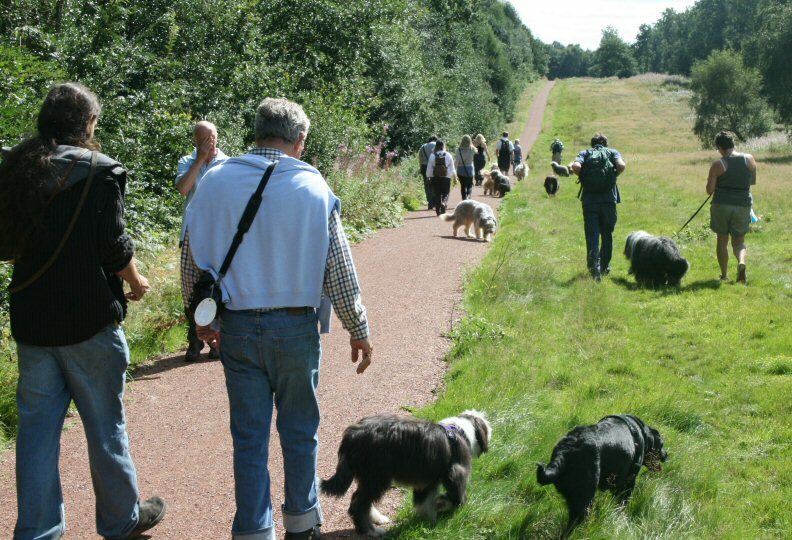 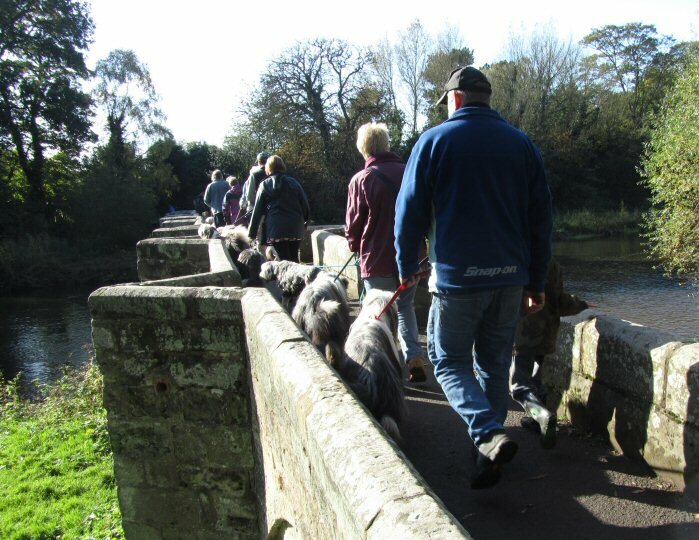 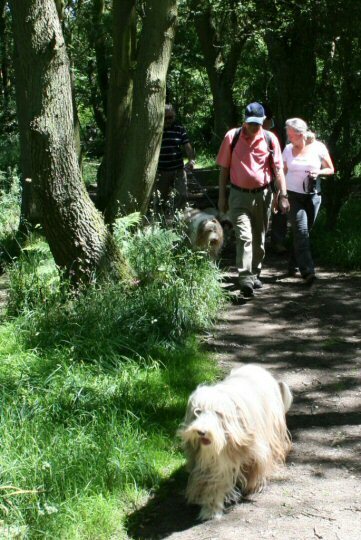 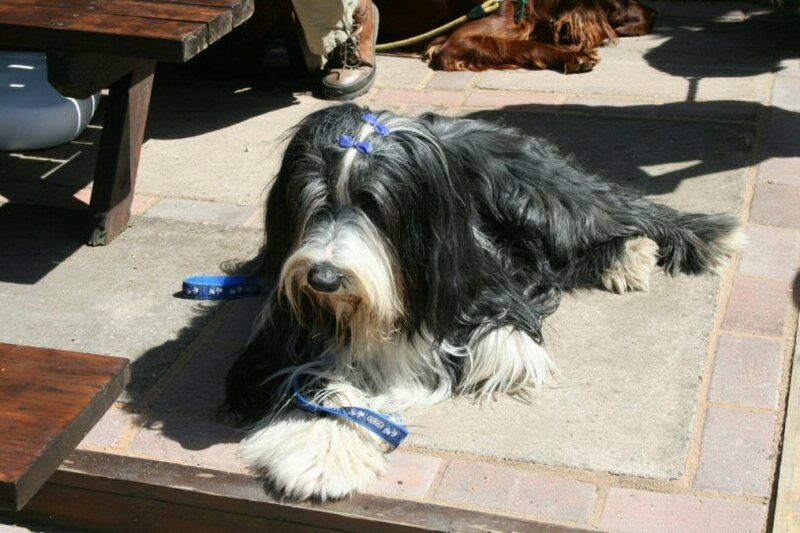 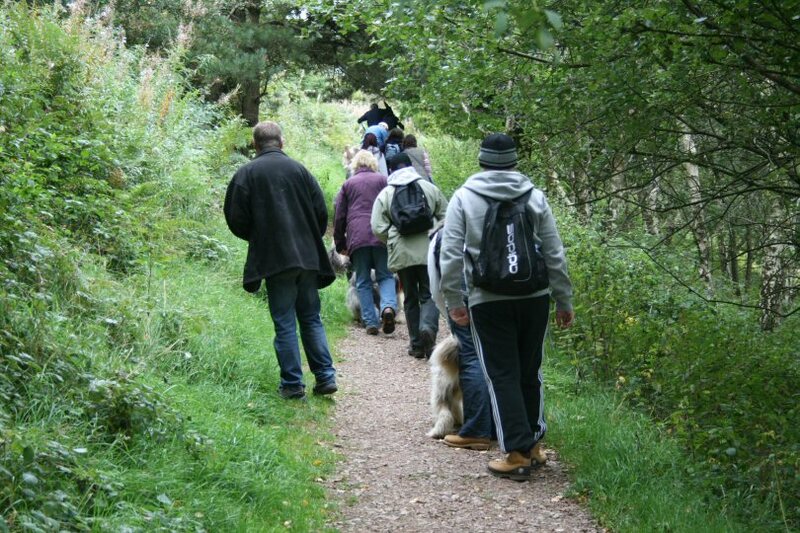 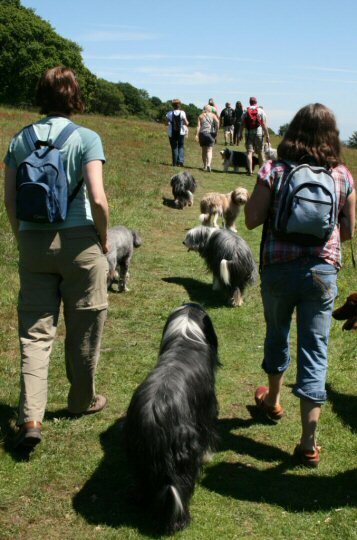 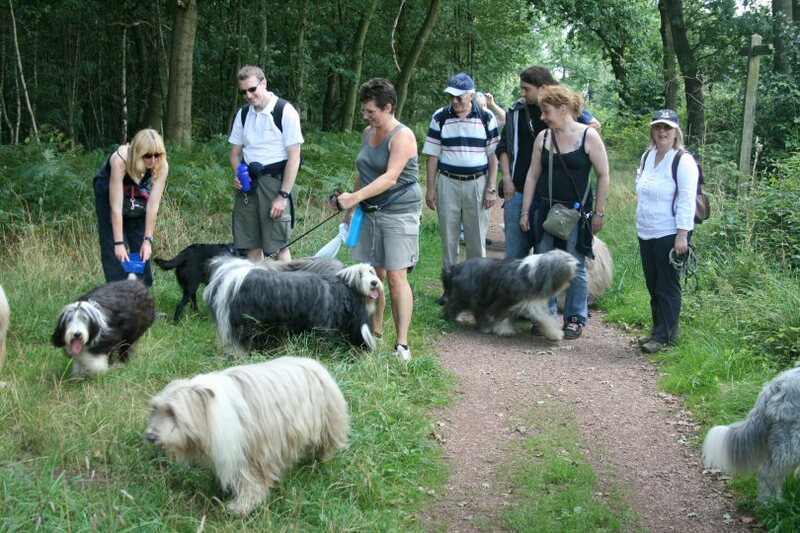 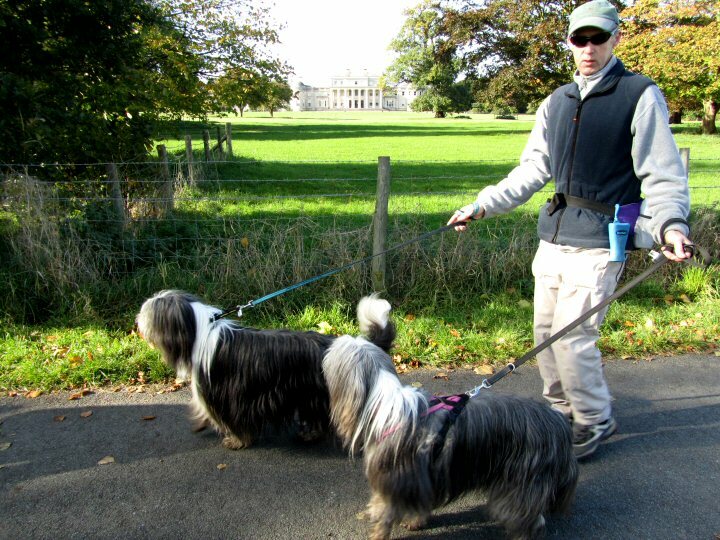 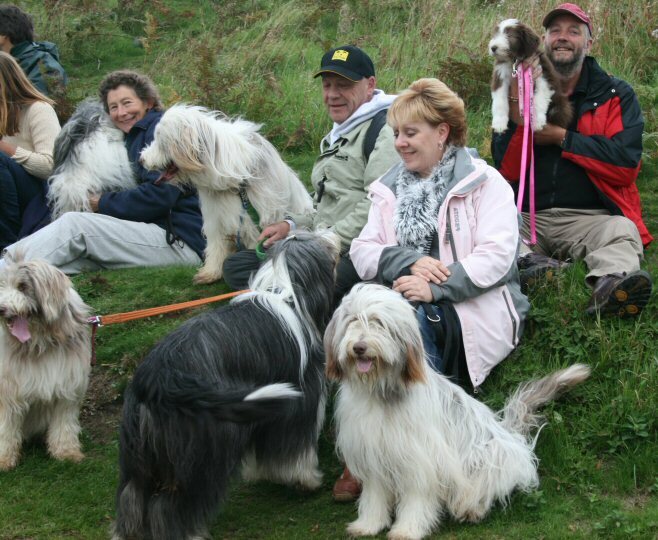 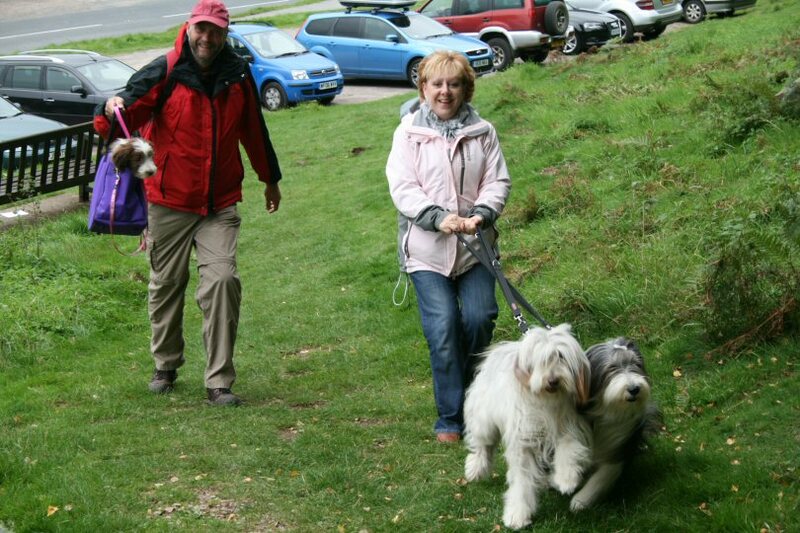 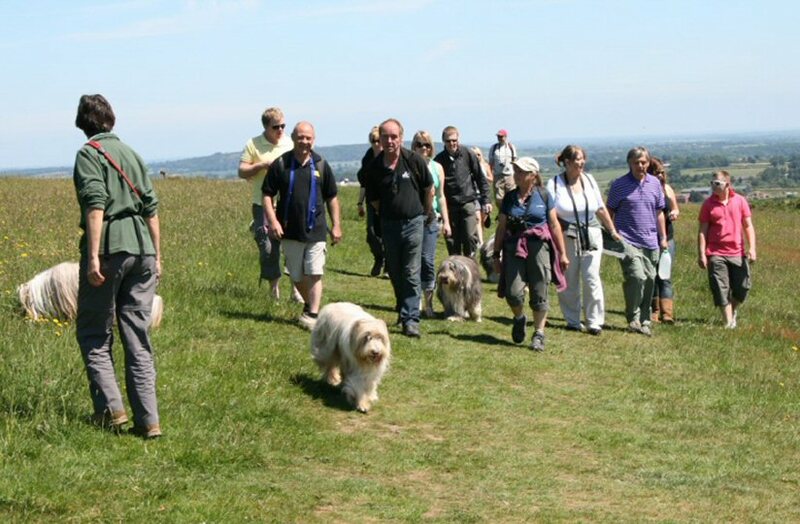 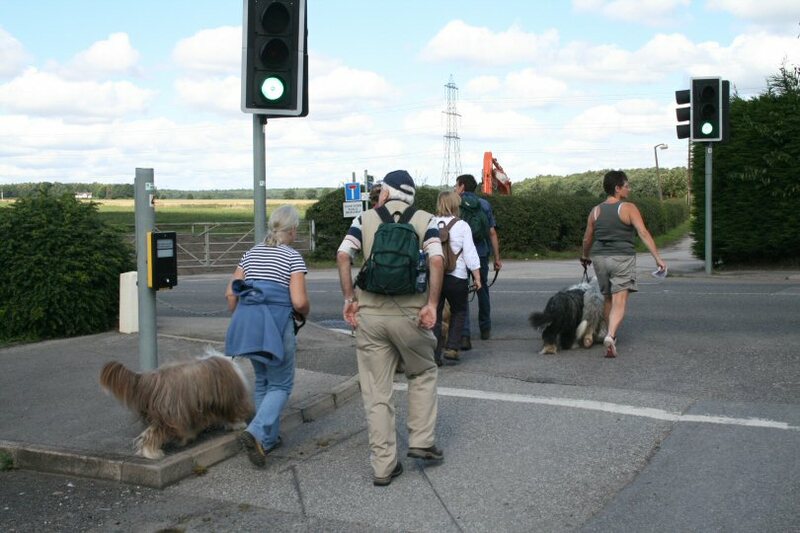 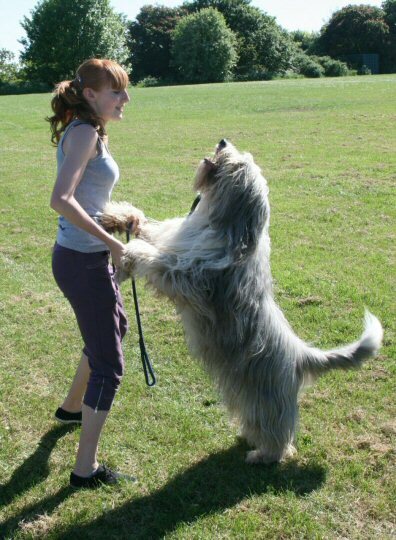 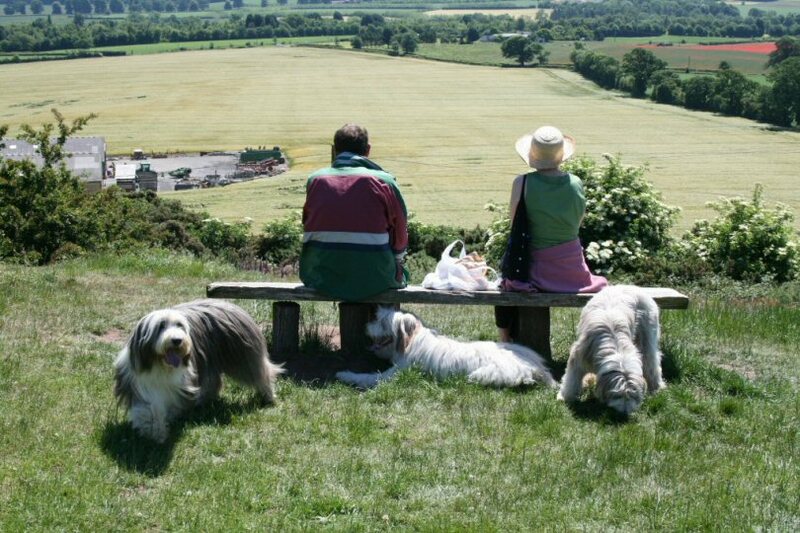 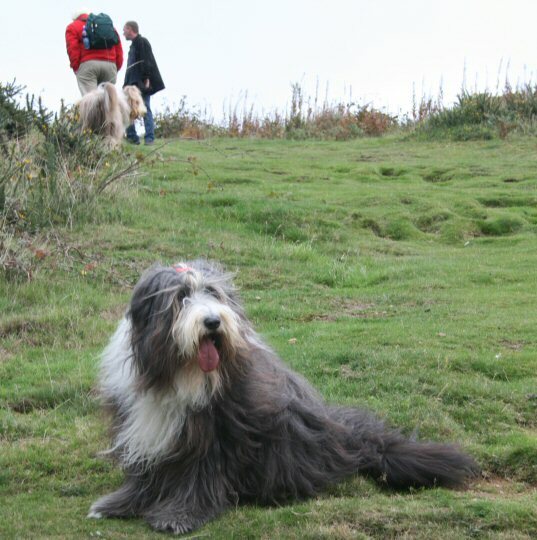 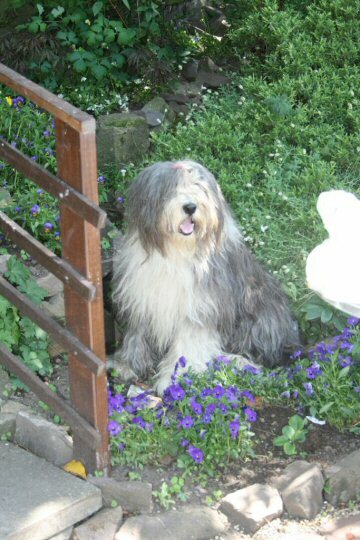 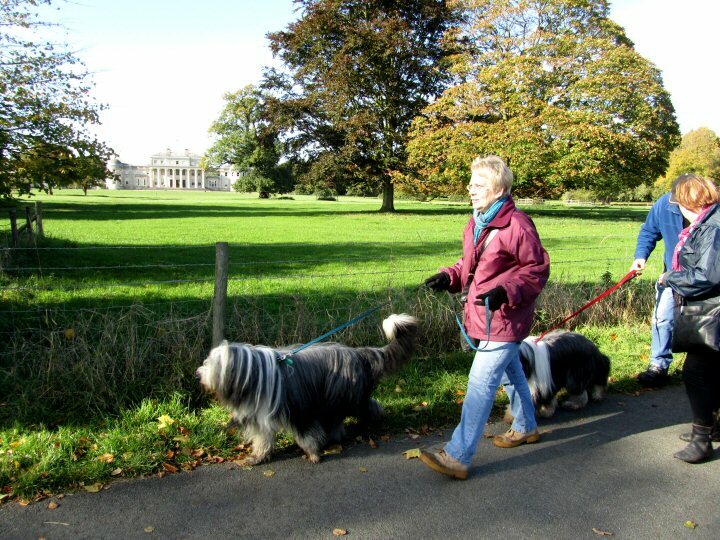 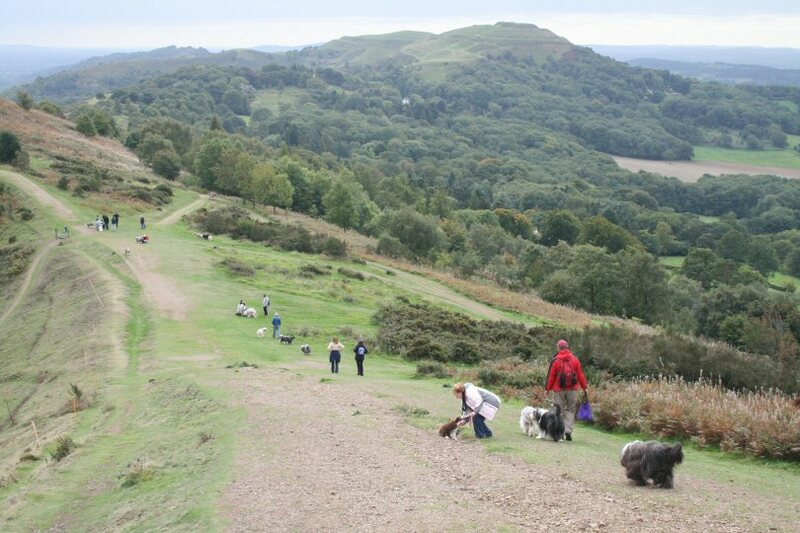 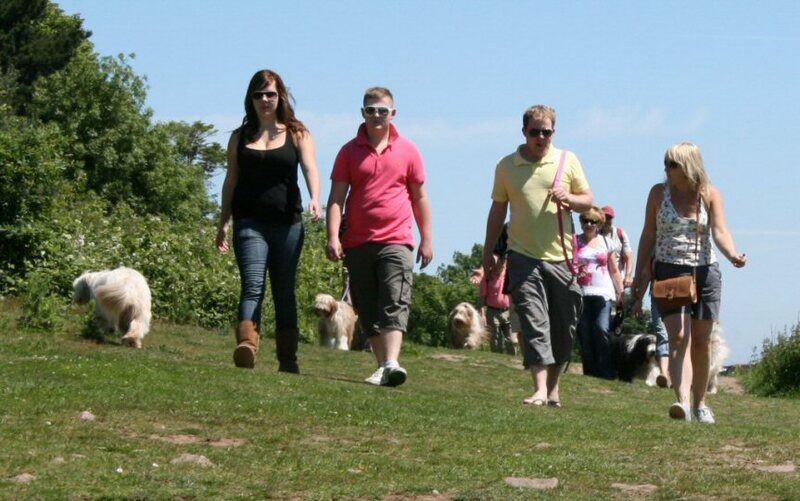 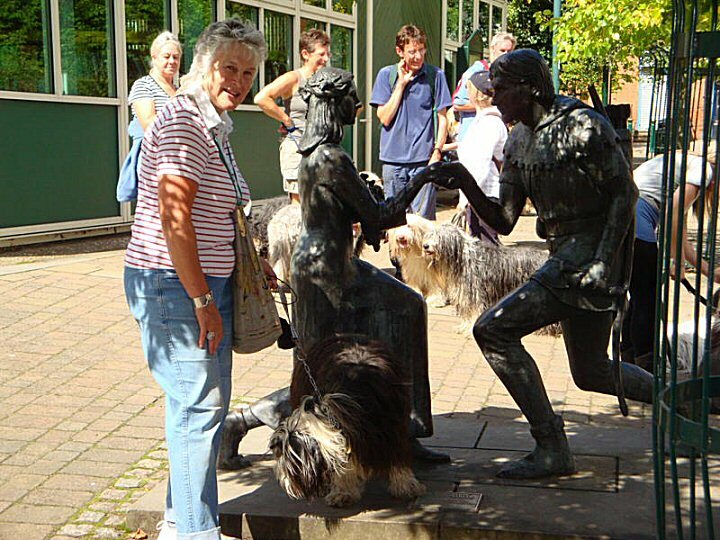 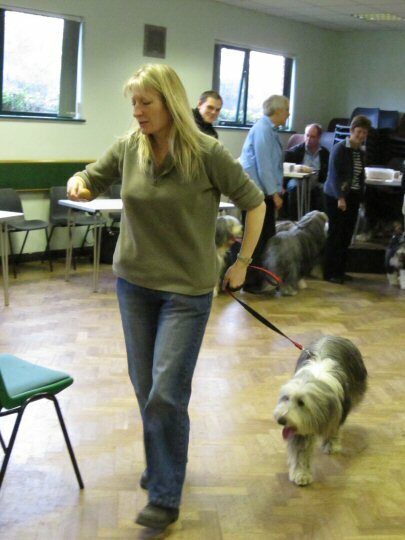 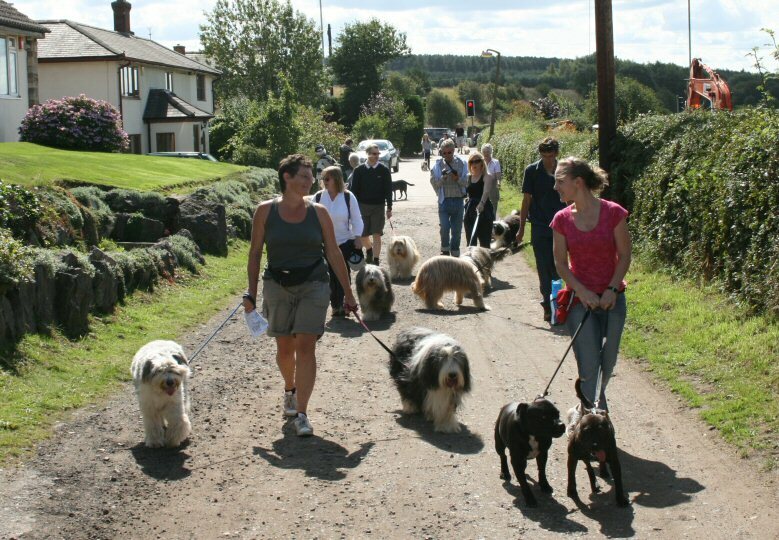 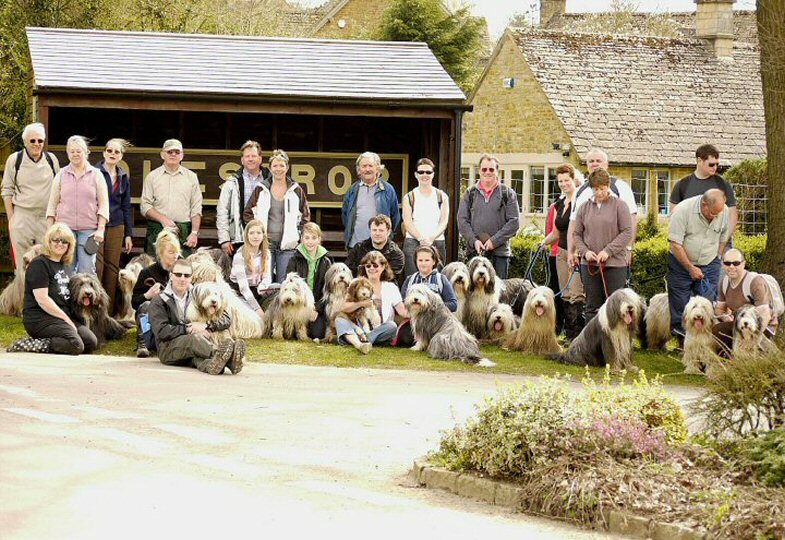 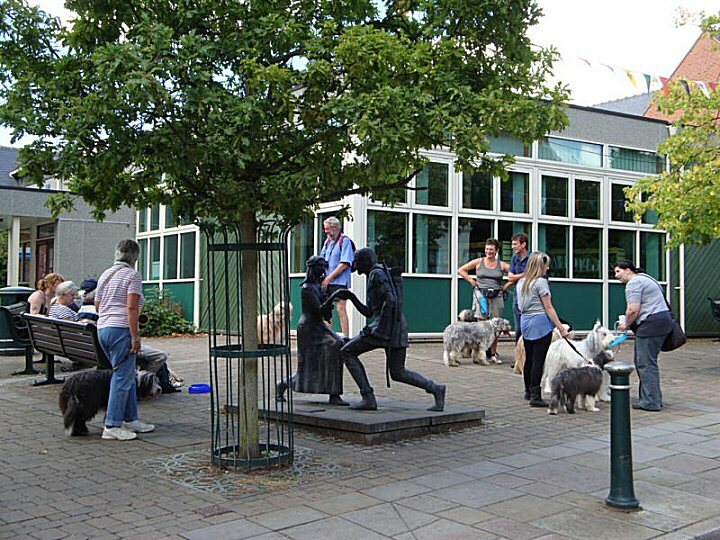 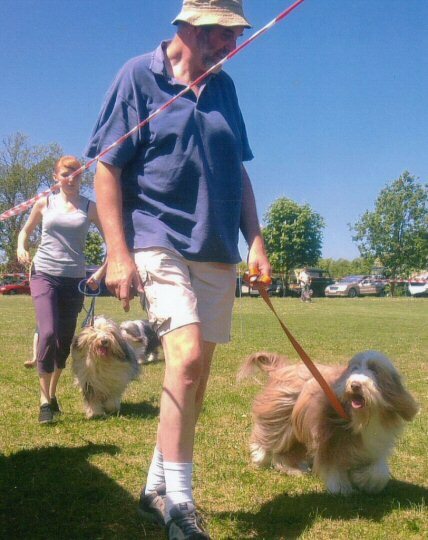 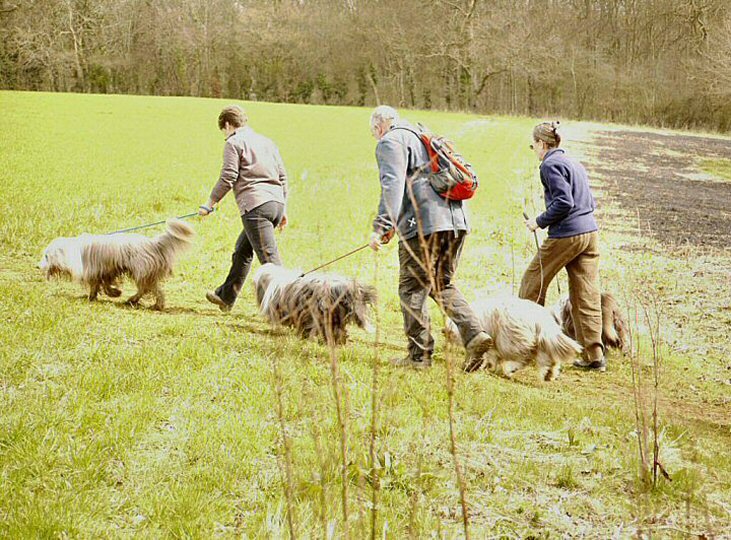 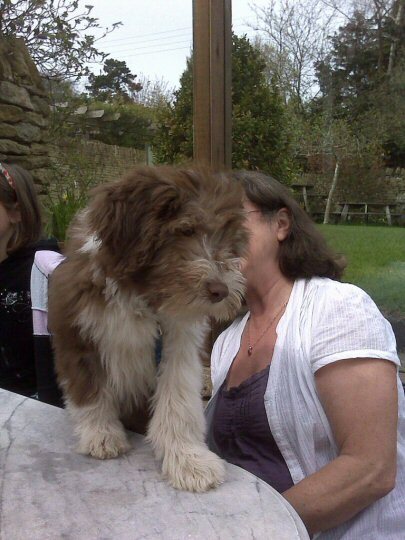 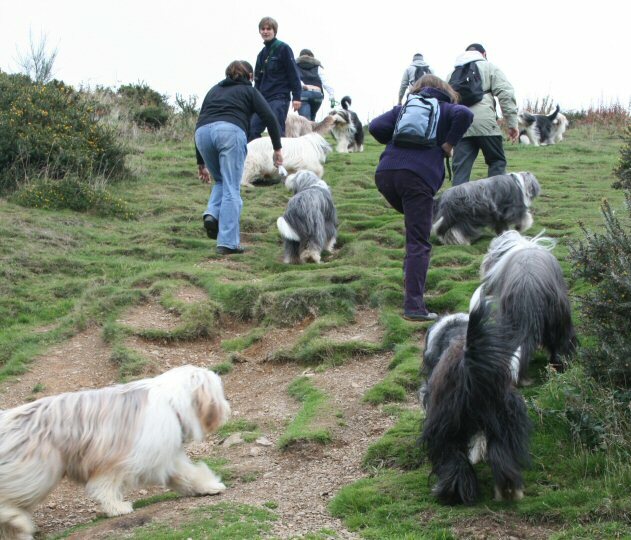 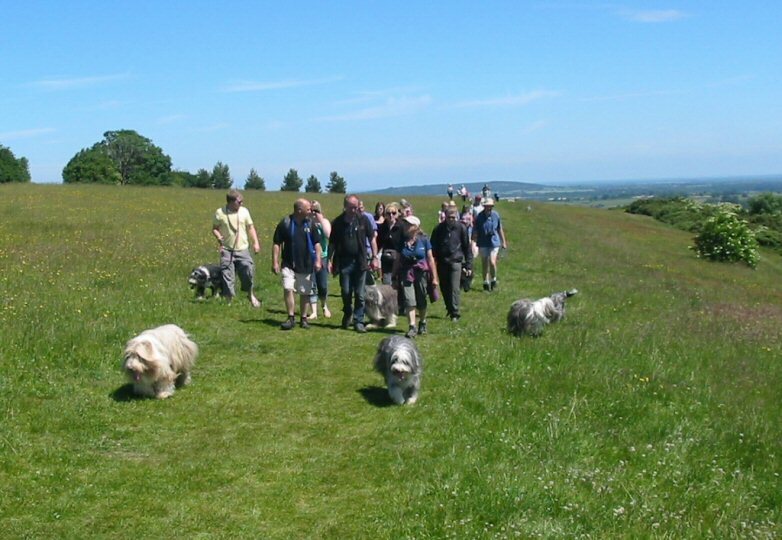 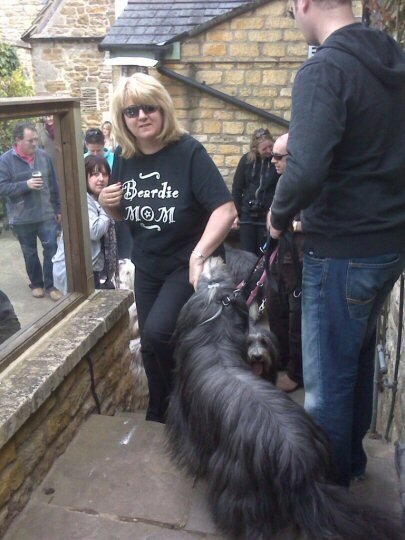 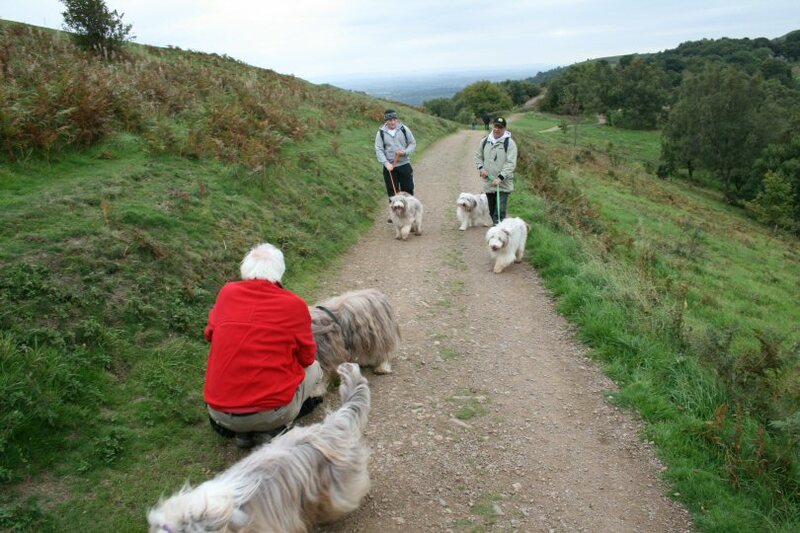 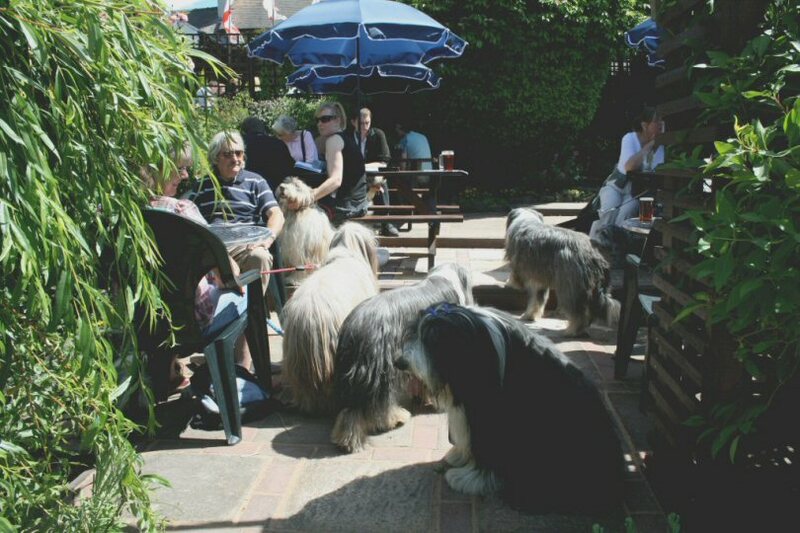 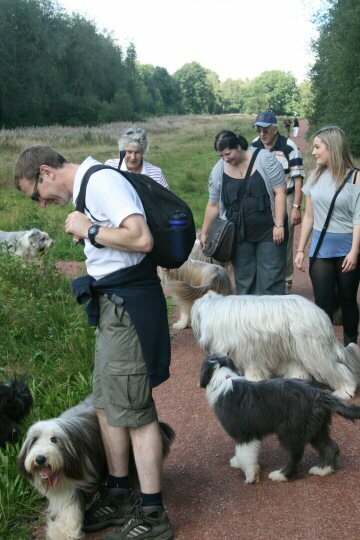 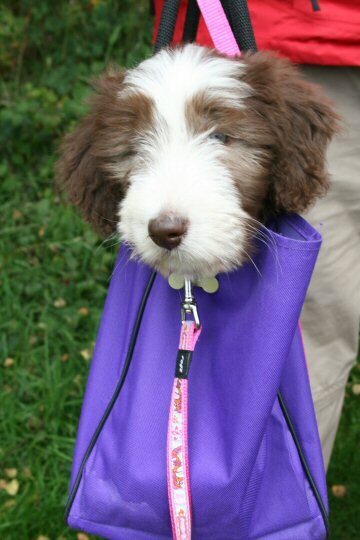 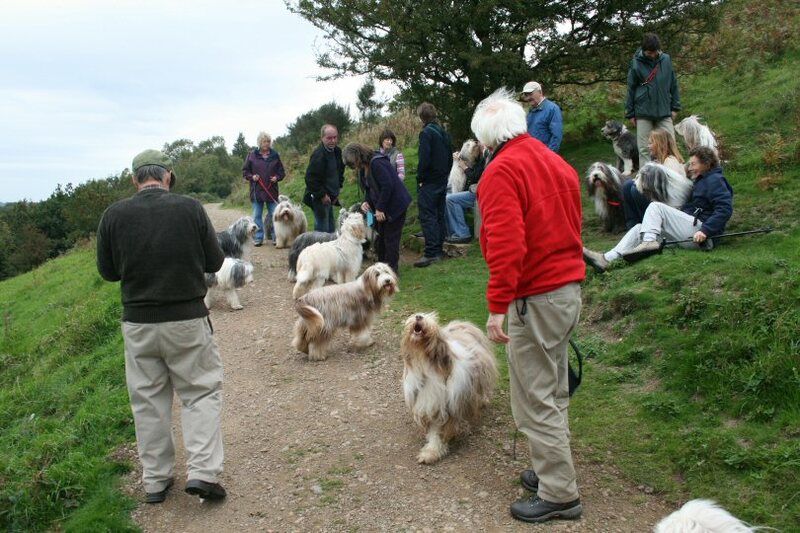 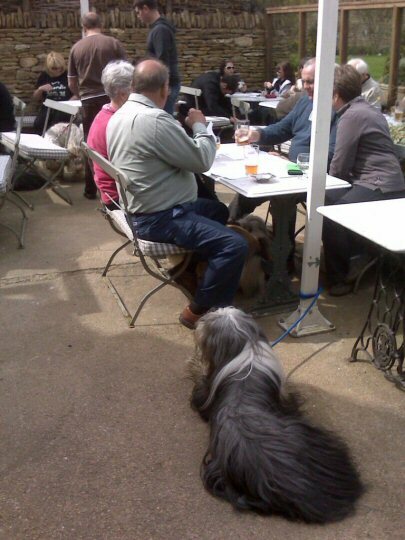 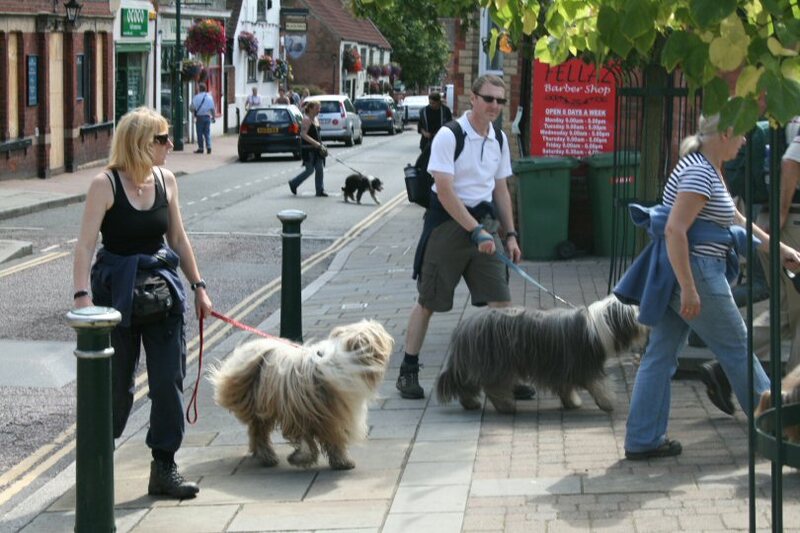 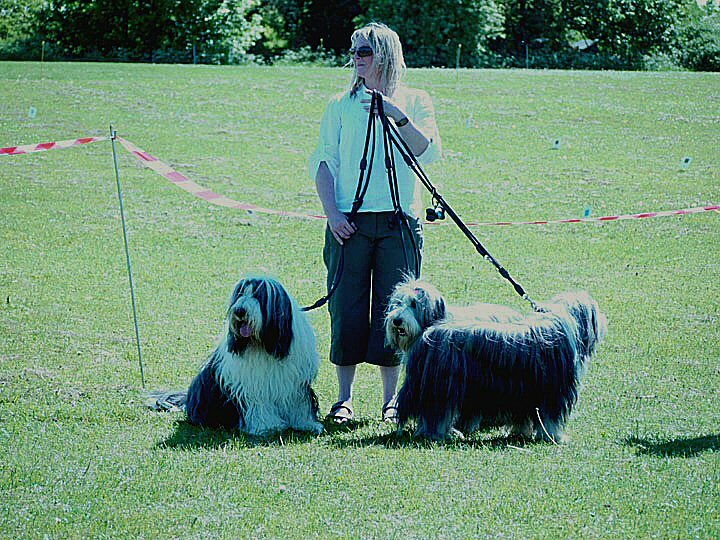 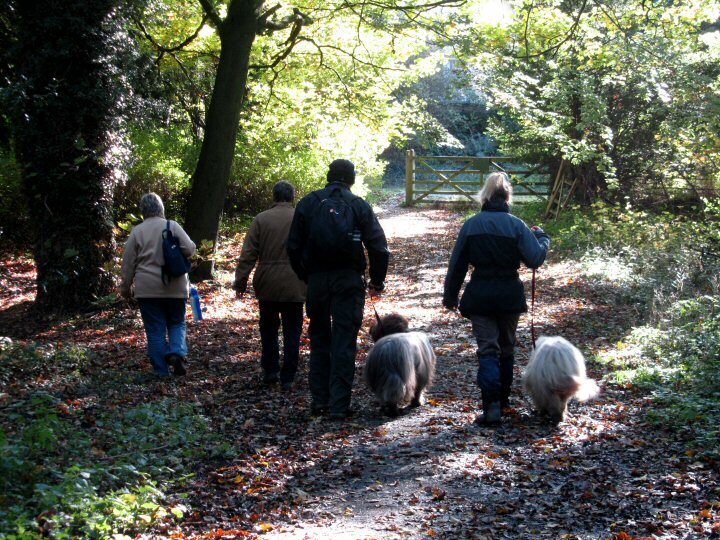 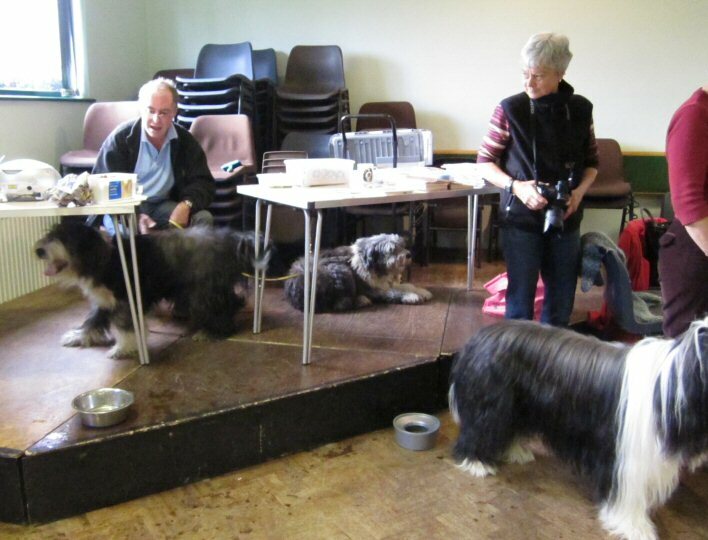 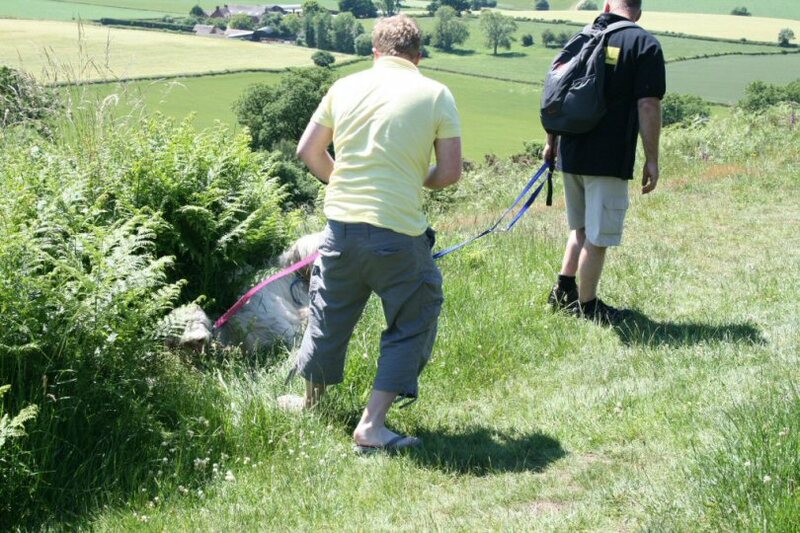 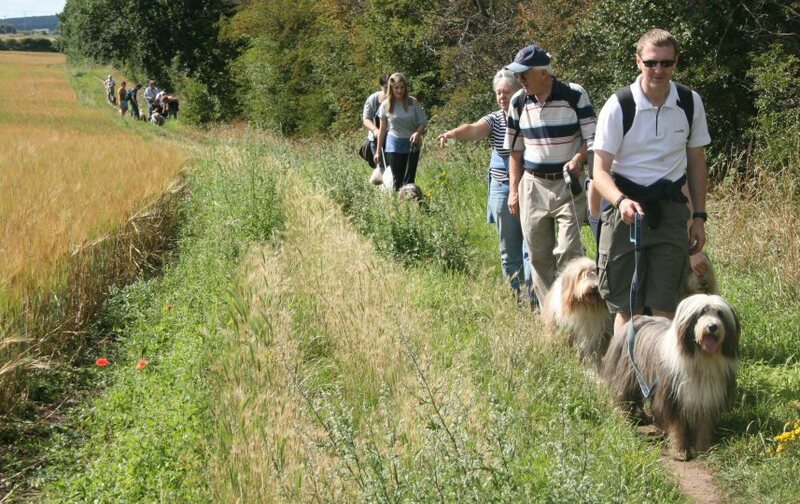 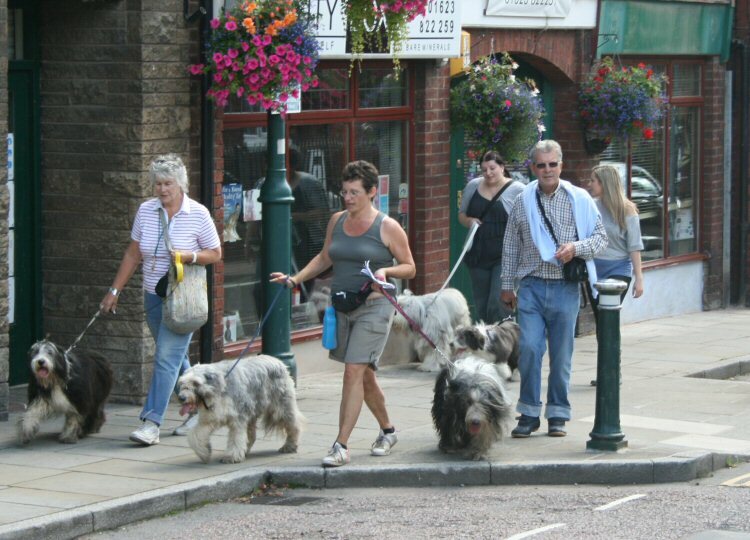 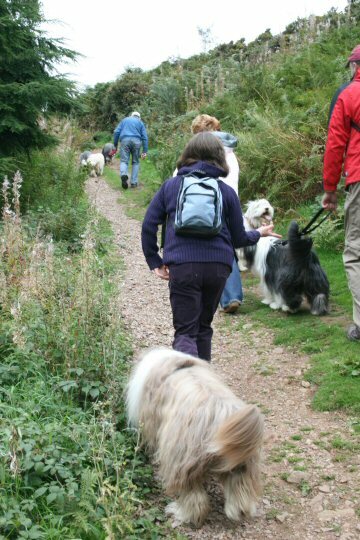 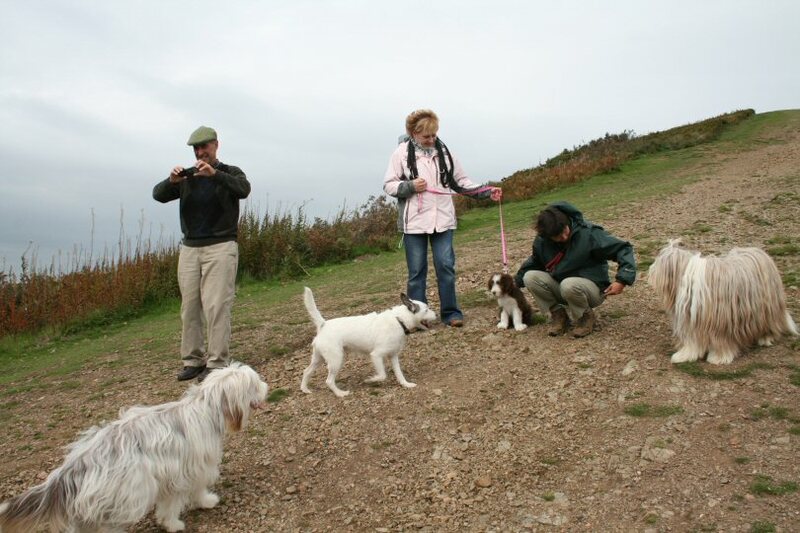 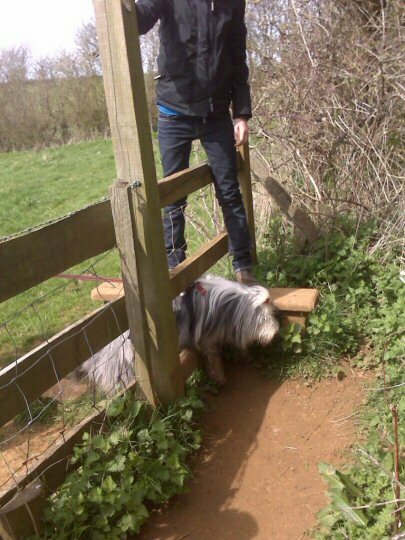 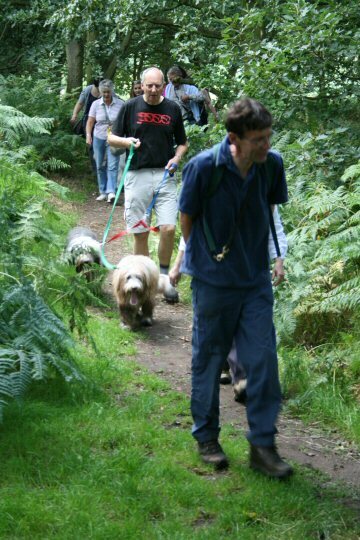 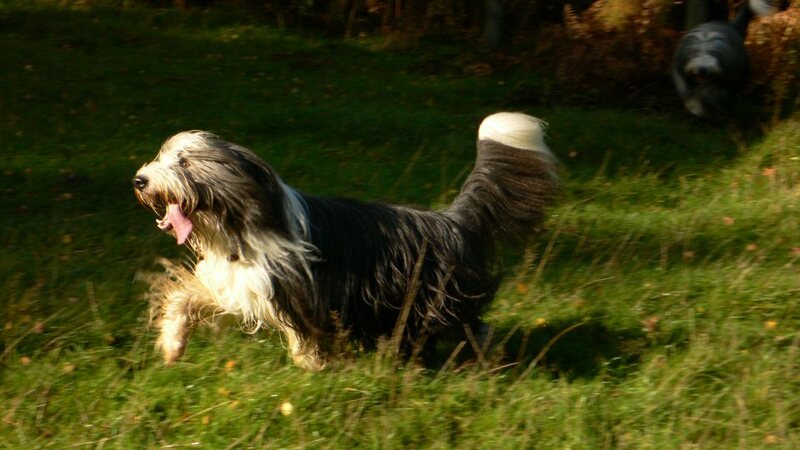 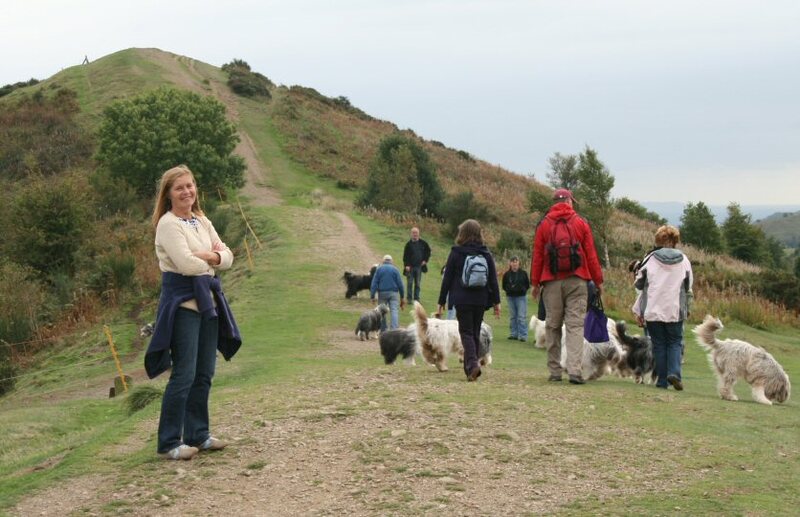 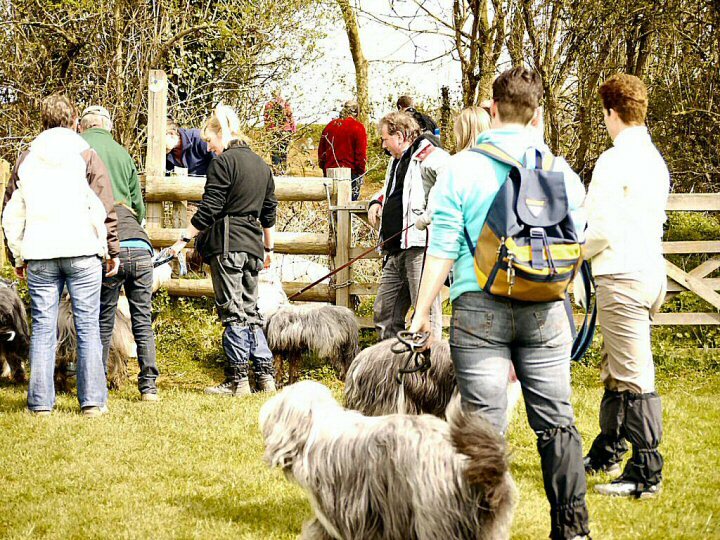 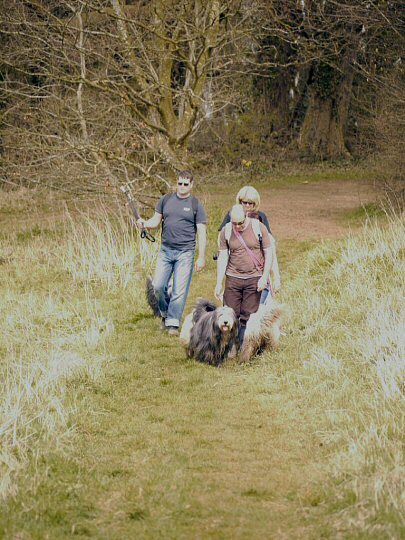 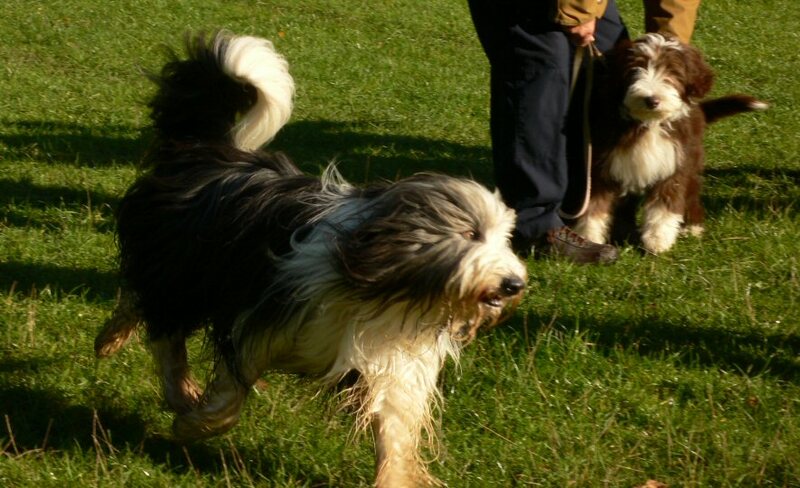 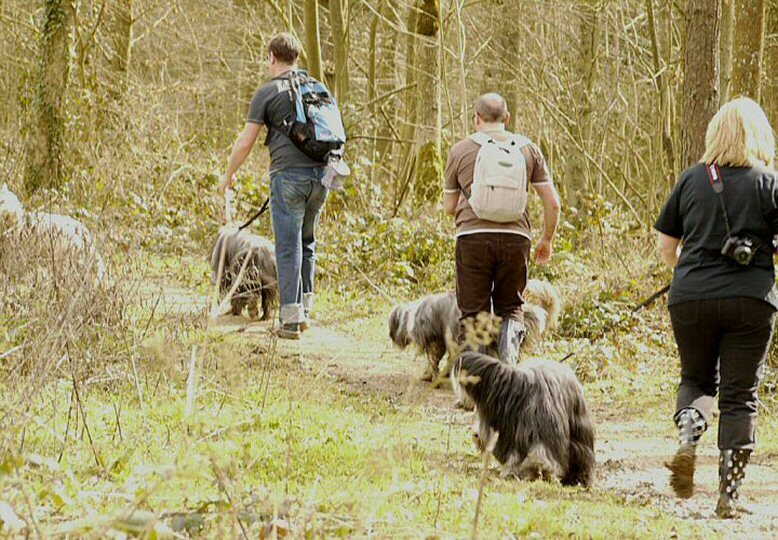 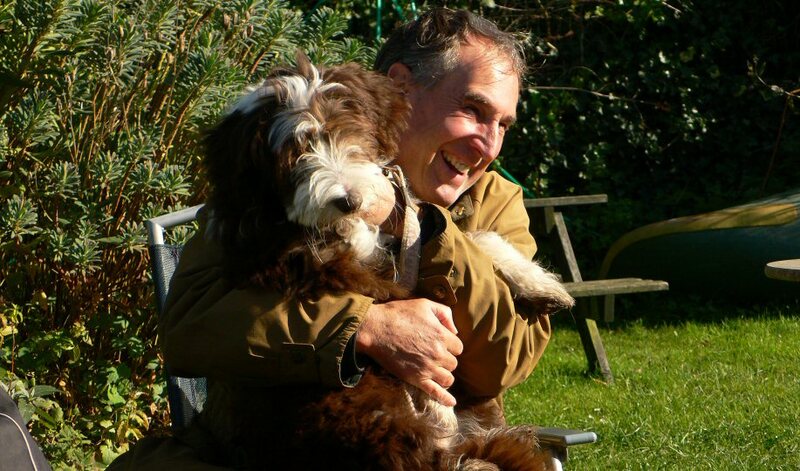 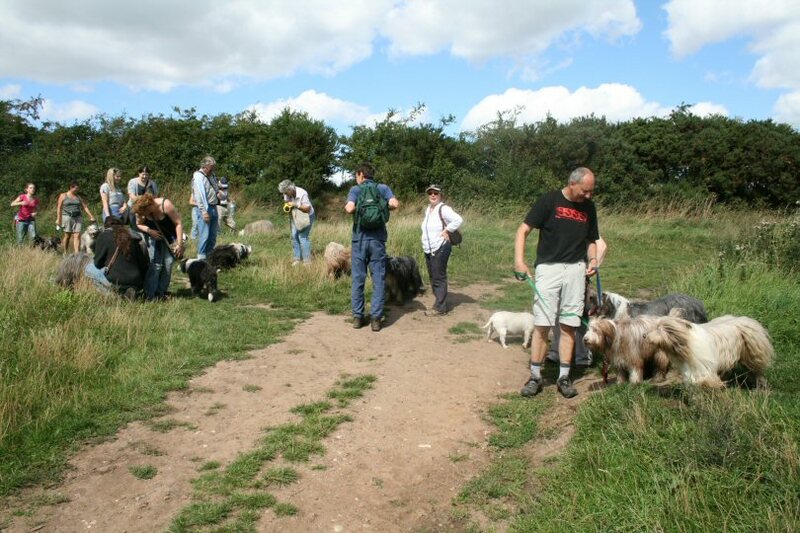 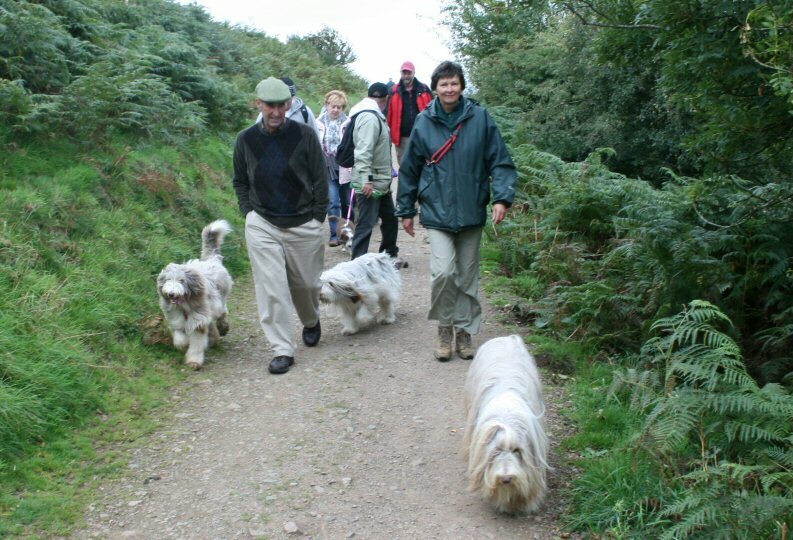 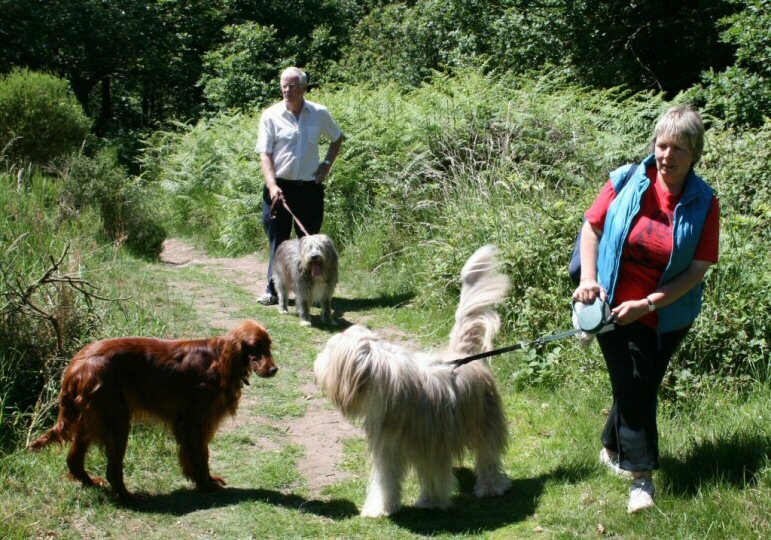 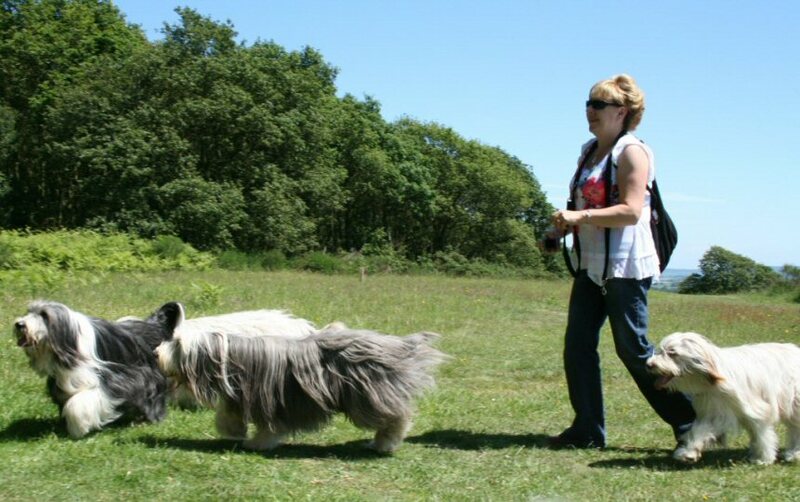 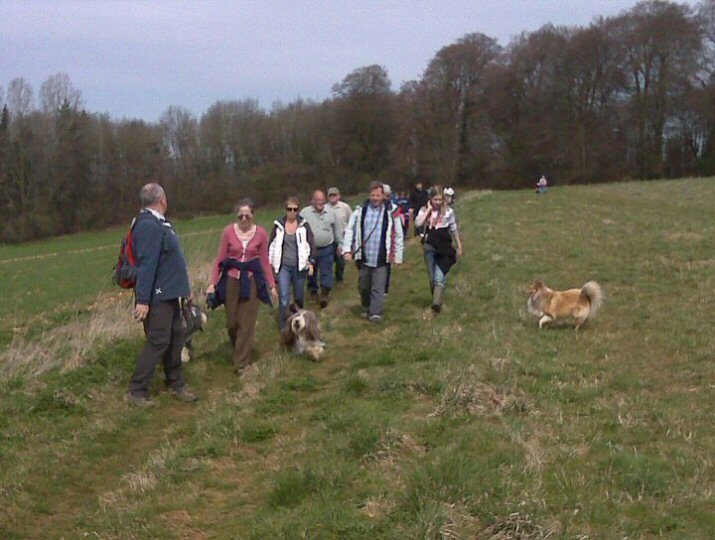 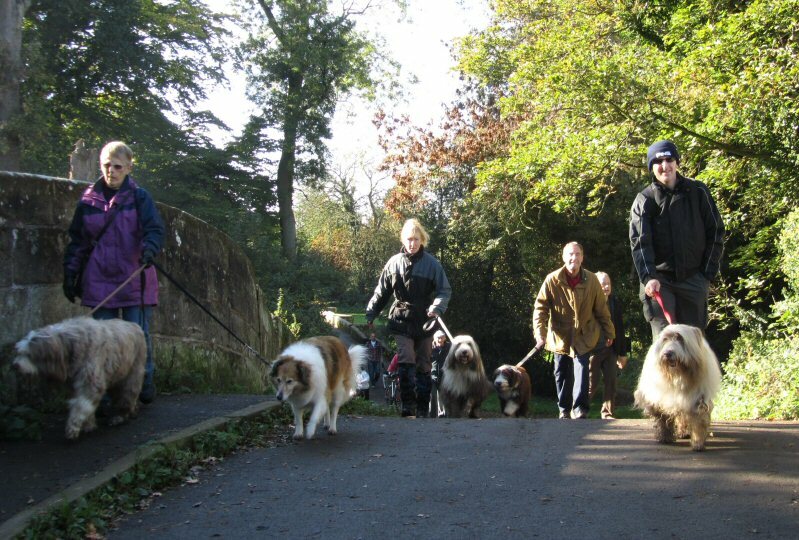 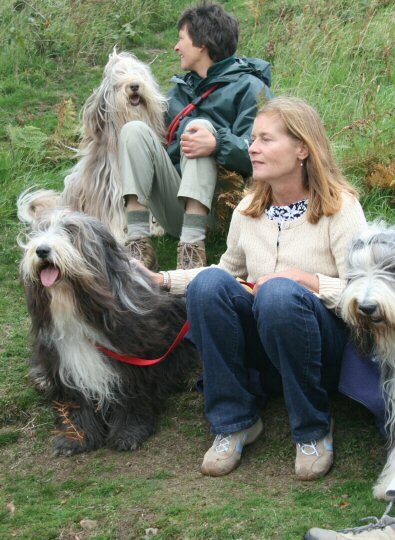 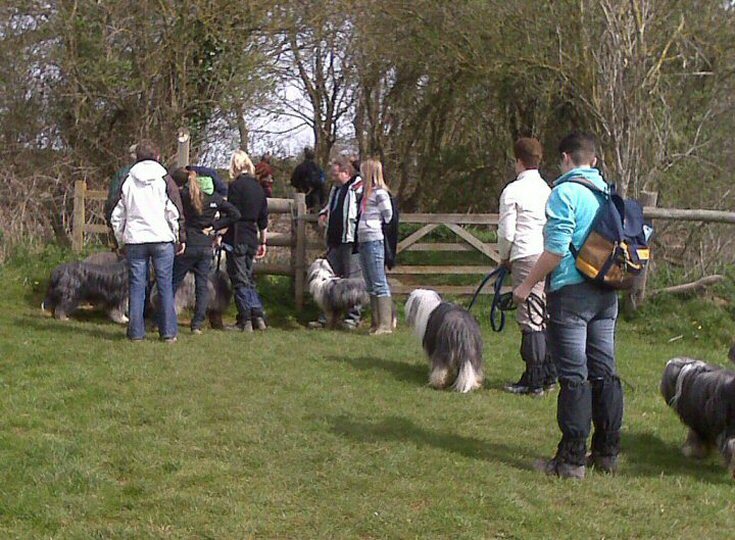 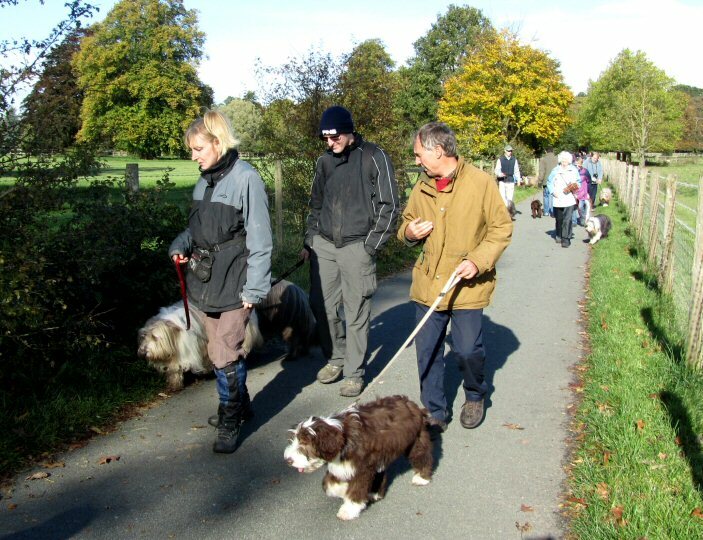 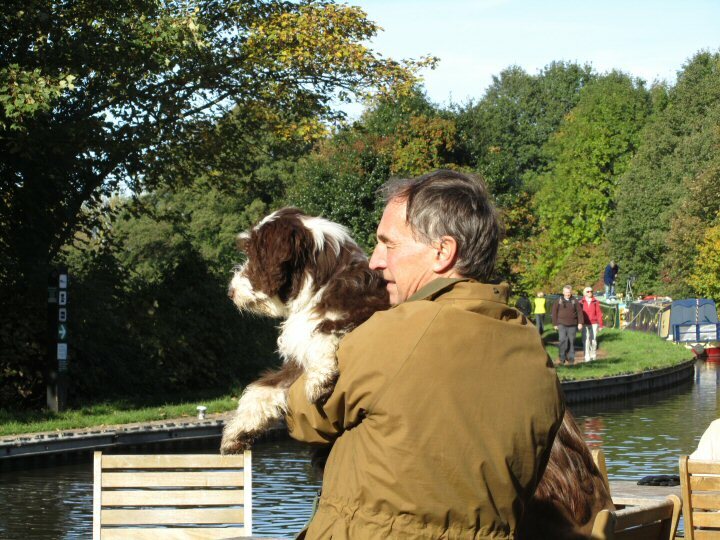 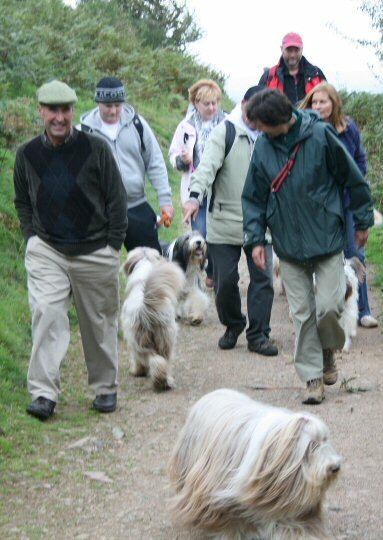 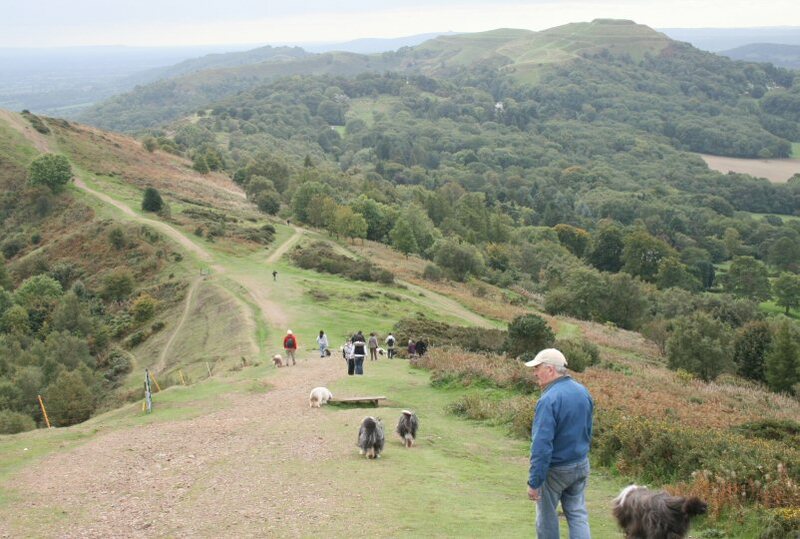 Our second Cotswold Ramble took place on 11th April 2010 and attracted a large group of walkers and their dogs. 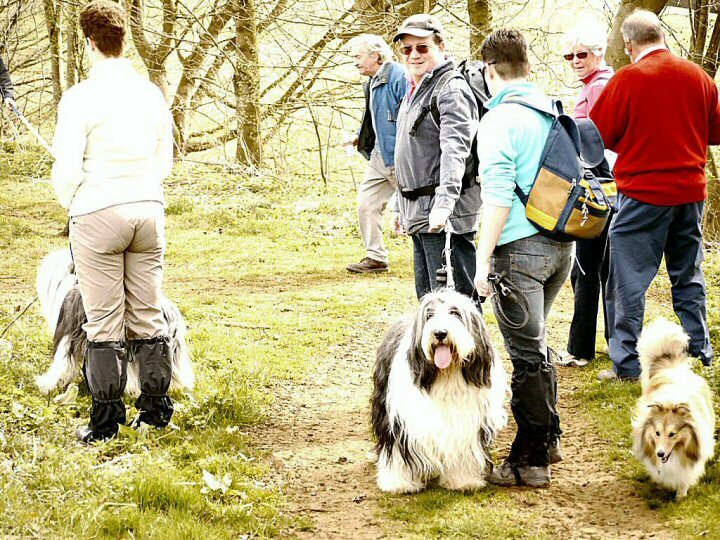 Despite muddy conditons for part of the route, the weather was very pleasant and the Cotswold scenery was beginning to green up after the long winter. 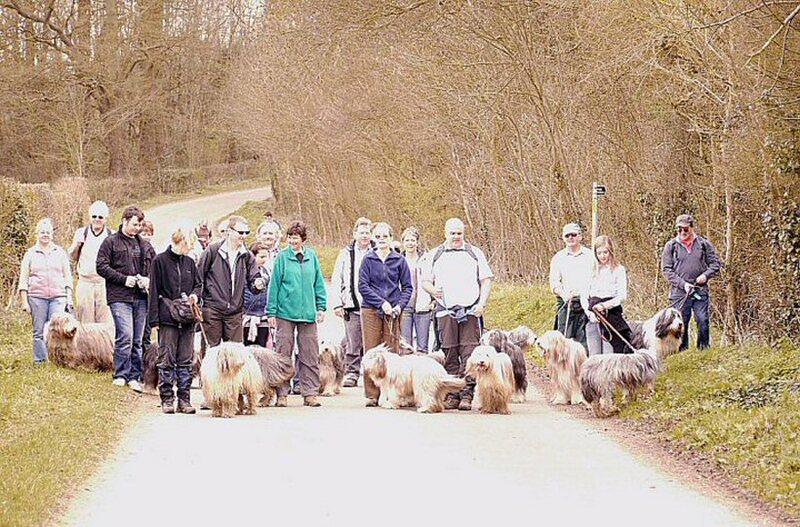 After the walk, many of those who came along repaired to the 'Fox' pub in a neighbouring village for an excellent lunch. 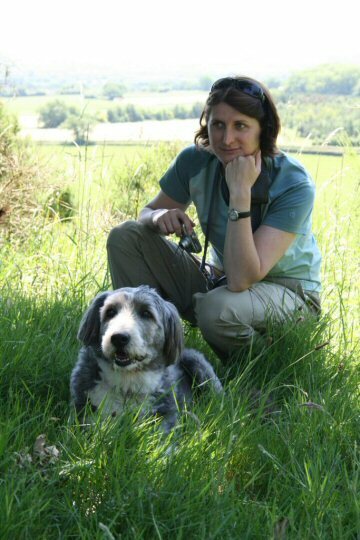 Our grateful thanks to Julia Edwards for organising both the event, lunch and the weather! 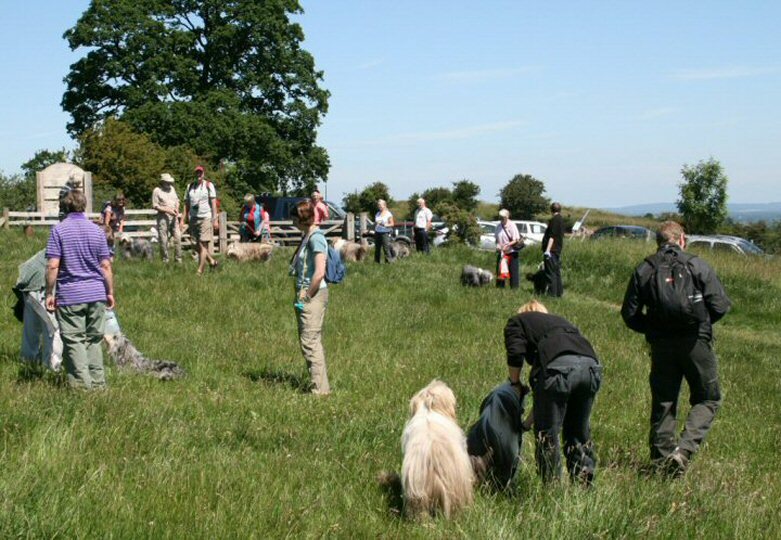 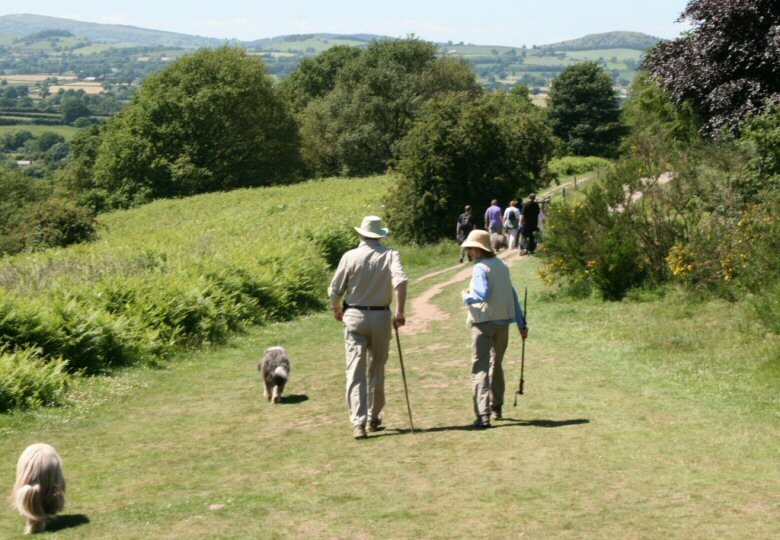 Another beautiful day for our third event of the year - a ramble across Lyth Hill Country Park a few miles south of Shrewsbury. 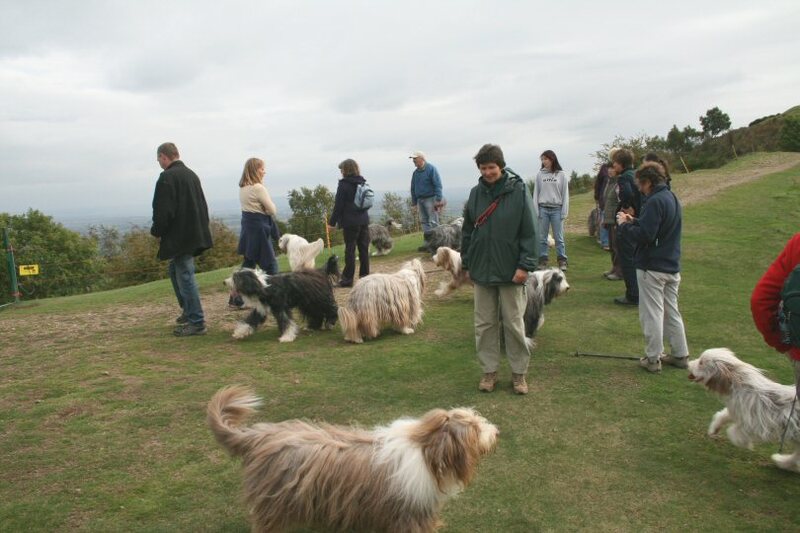 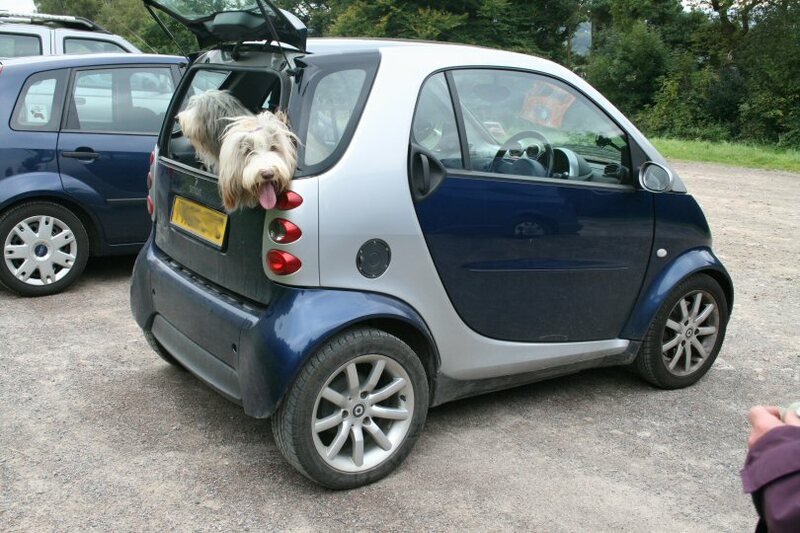 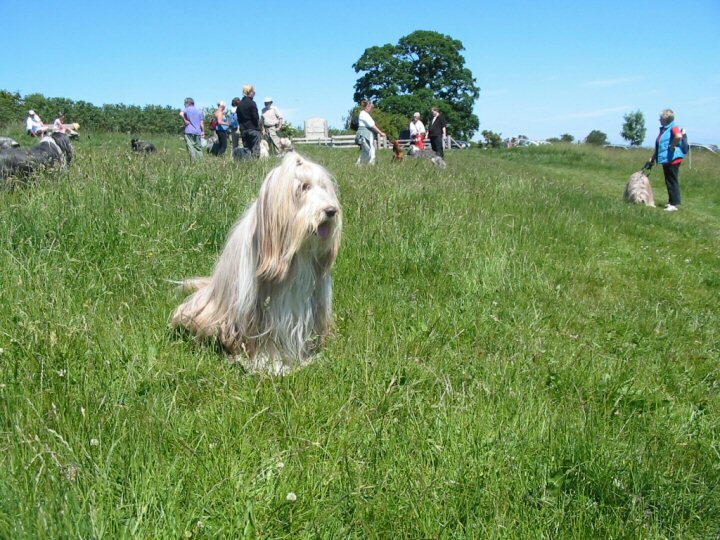 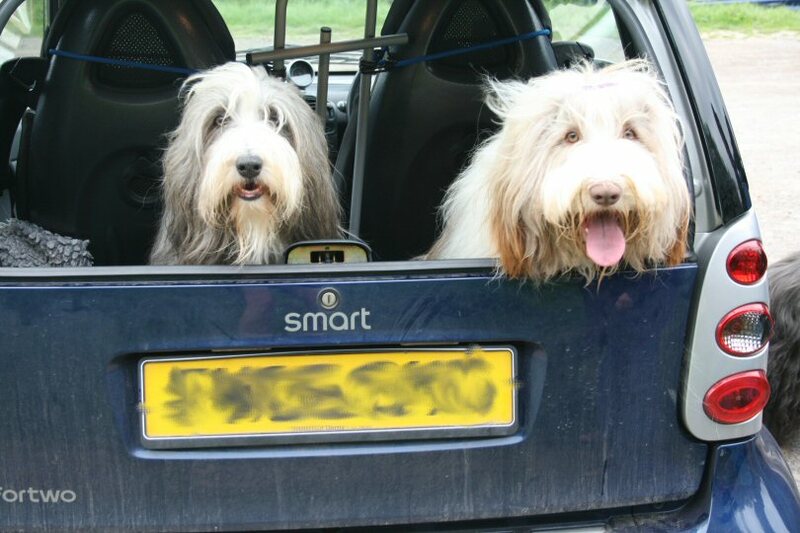 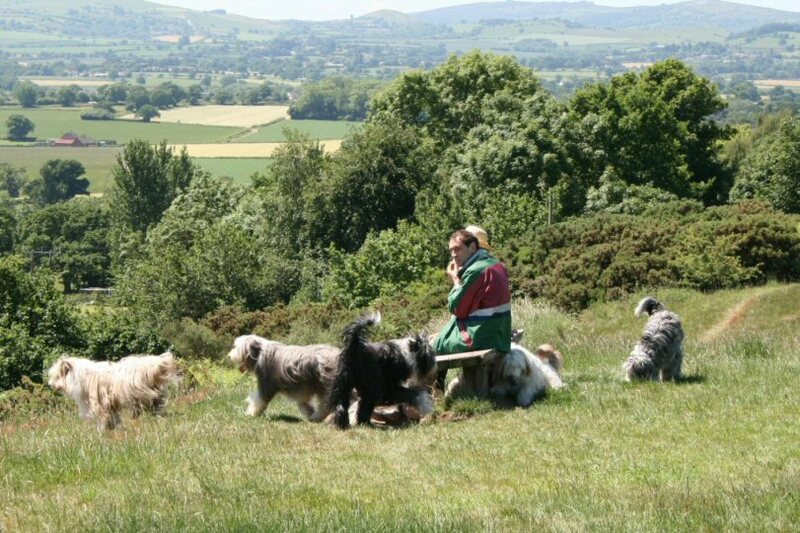 There was a really good turn-out for this with over 25 beardie owners / prospective owners and their dogs enjoying fantastic views over the Shropshire countryside. 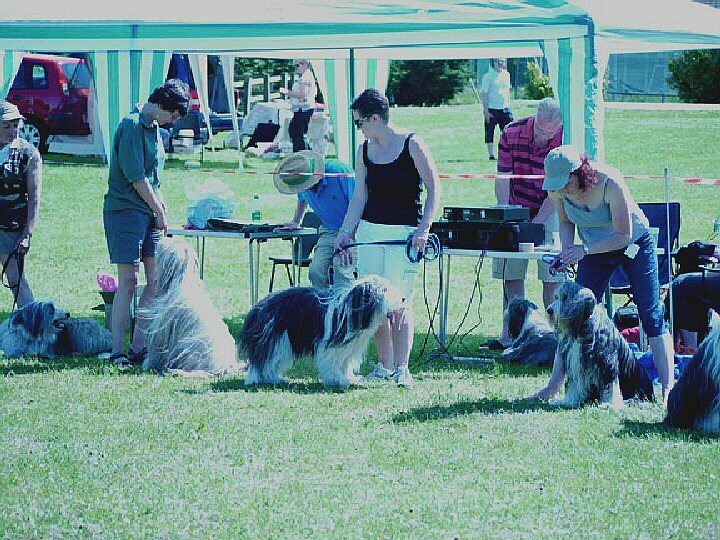 A pleasant breeze prevented us over-heating under an unrelenting sun. 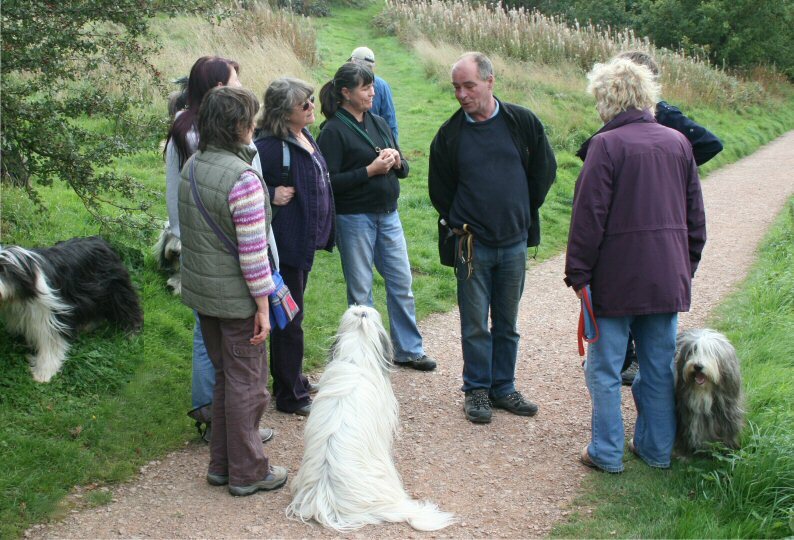 Our thanks to Ian for organising the ramble and the meal at the Three Fishes afterwards. 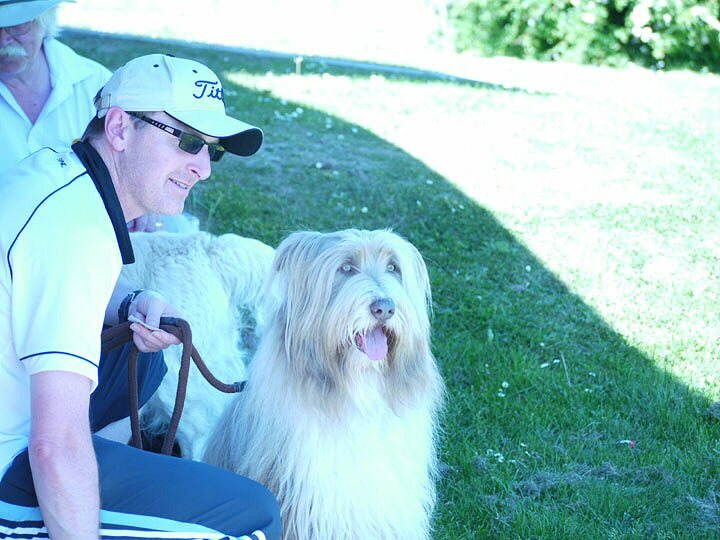 A superb day for all! 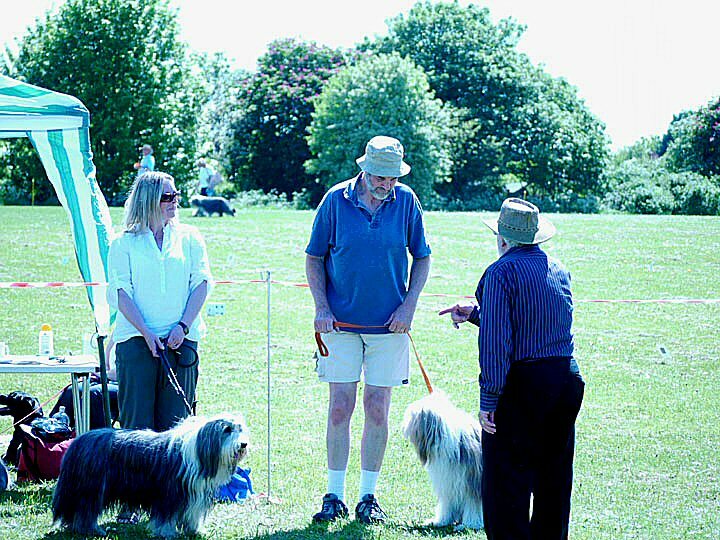 This was the fourth fine day in a row in our 2010 calendar of events! 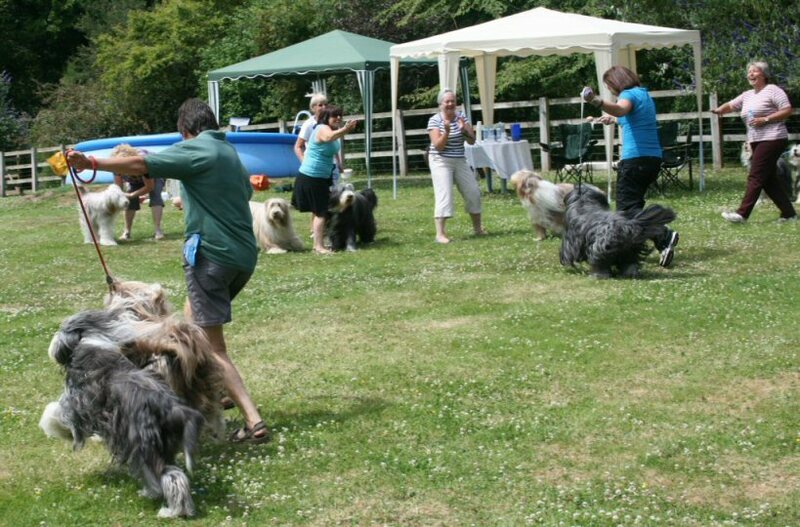 John and Christine (our branch chair) kindly threw open their home and grounds to the annual gathering known as the Beardie Bounce. 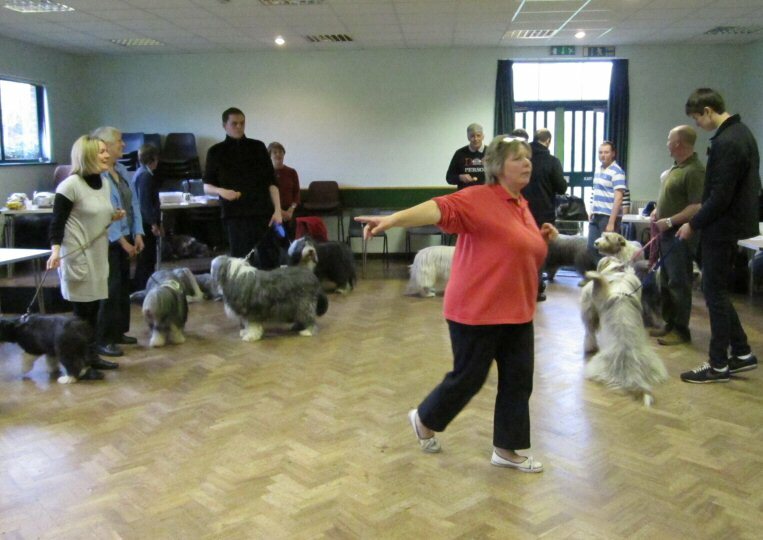 About 25 members and friends gathered for a lovely afternoon of games and food, whilst Maureen Sale was kept extremely busy with a succession of beardies taking Working Tests. 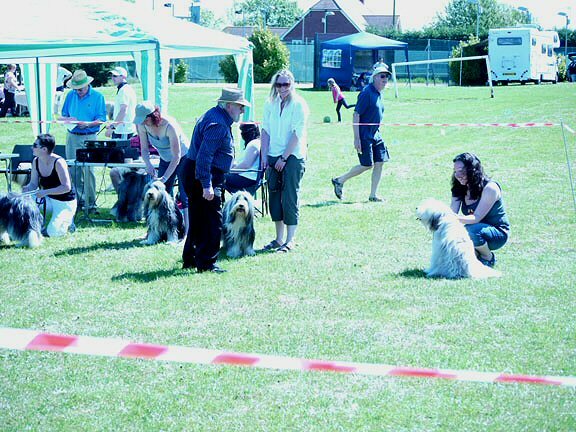 All in all, a lovely event. 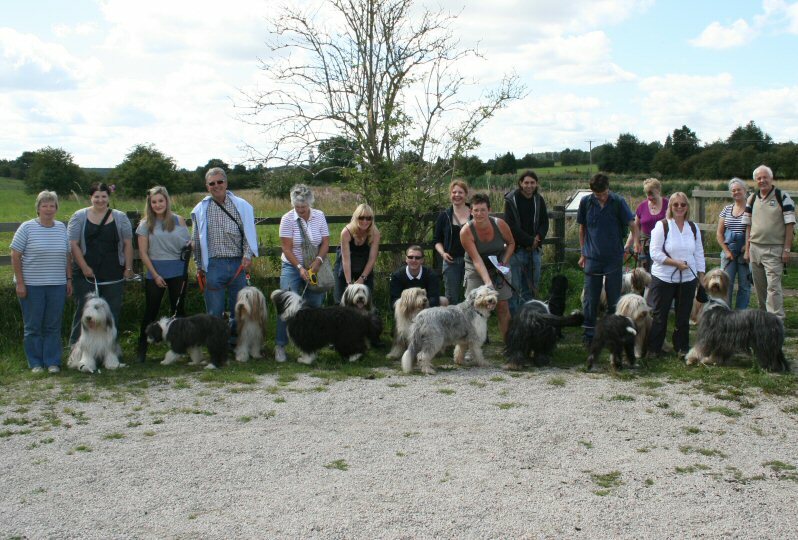 Our grateful thanks to our hosts for the day! 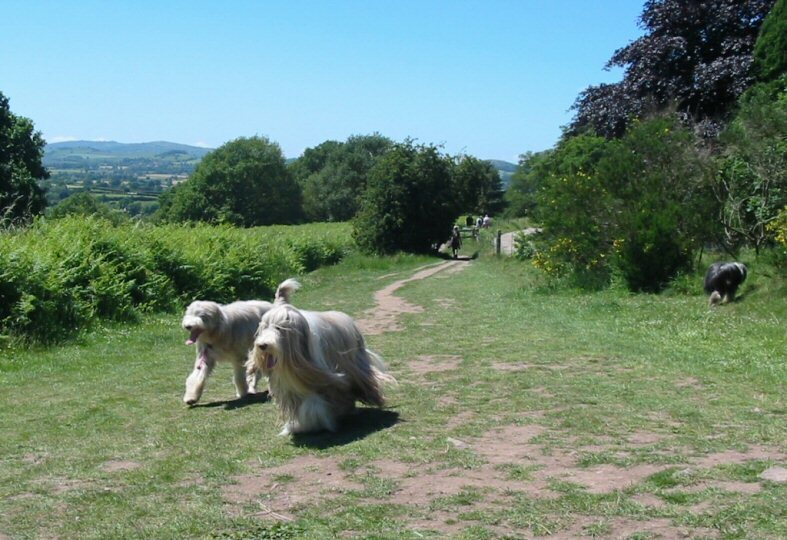 Yet another glorious day! 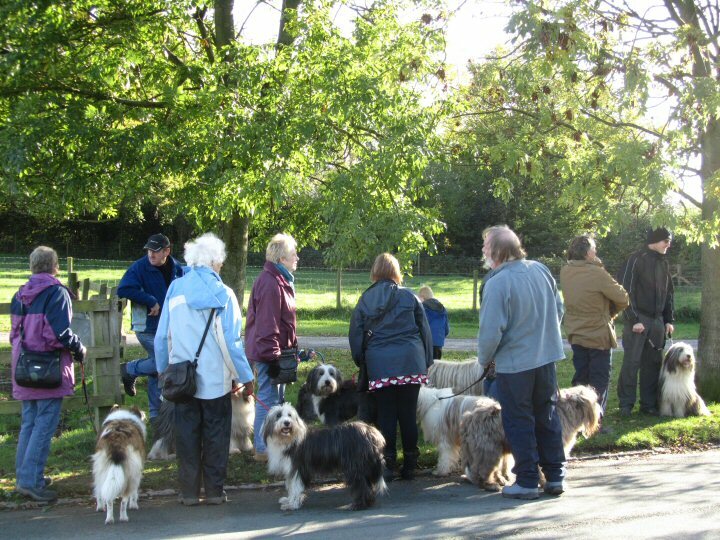 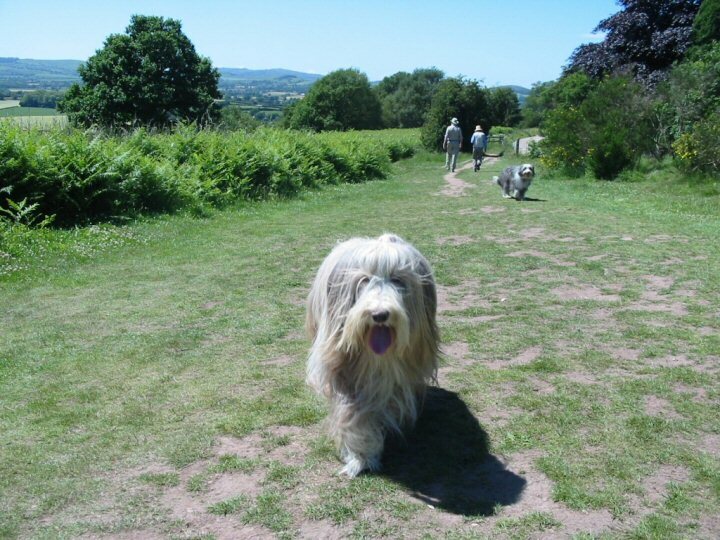 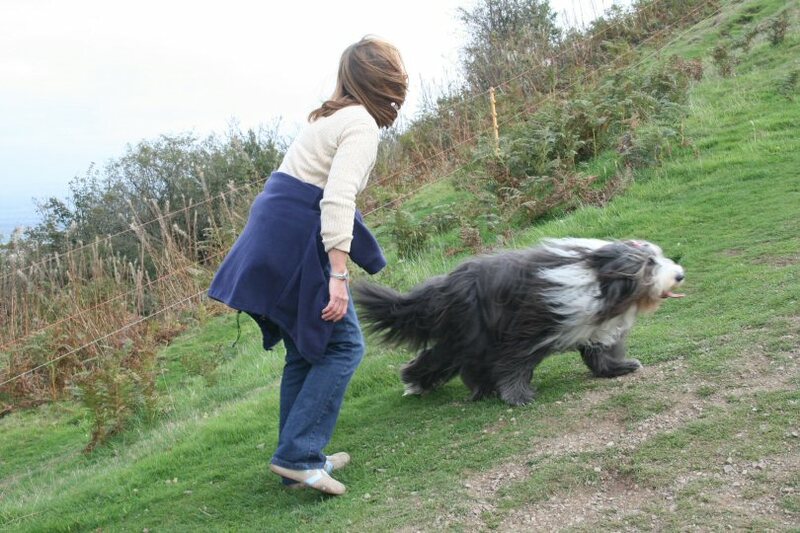 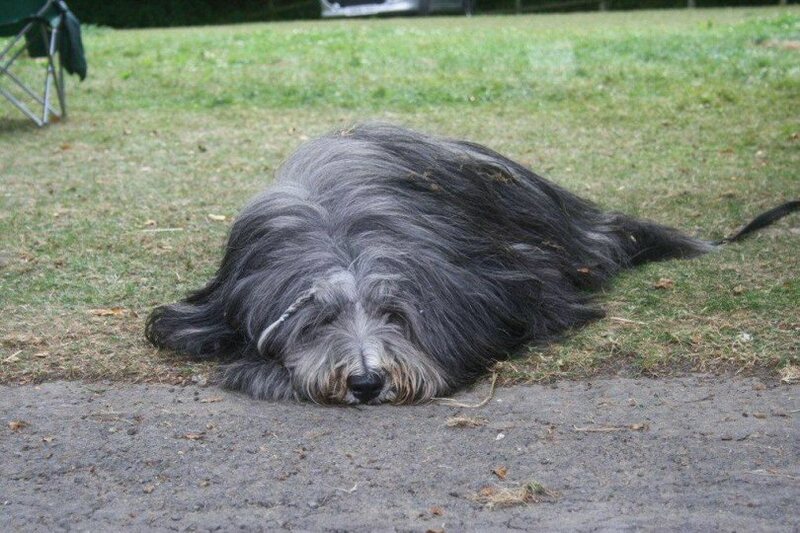 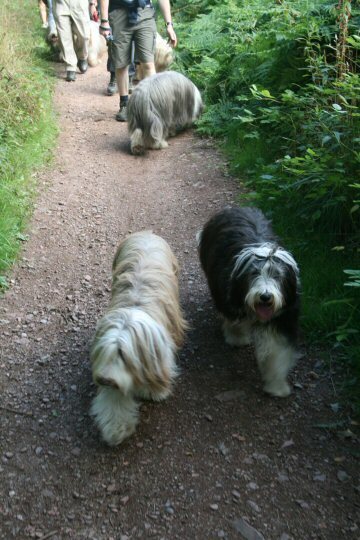 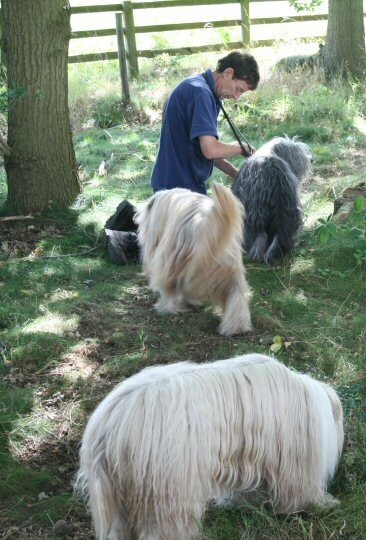 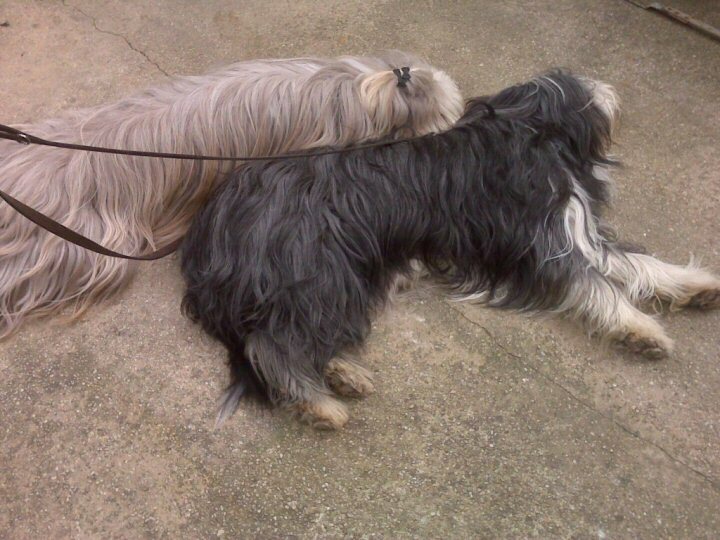 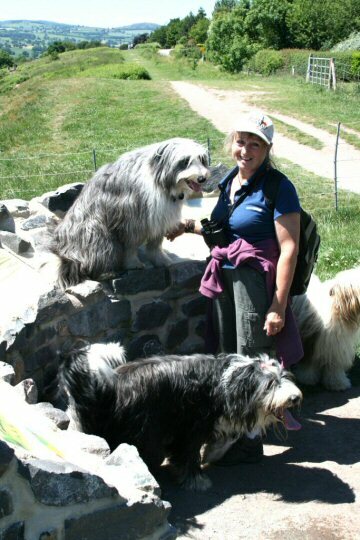 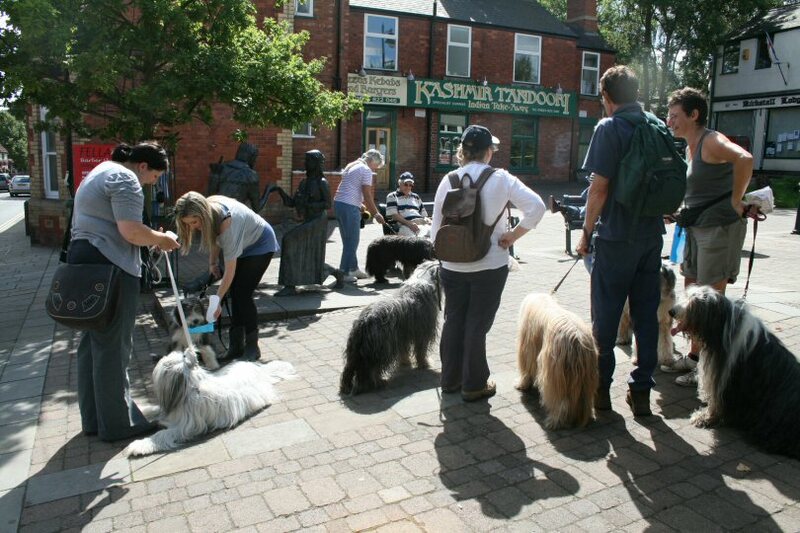 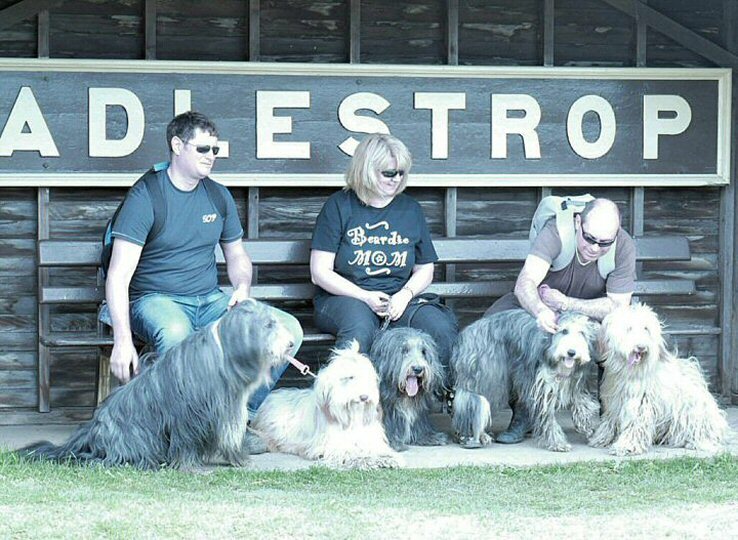 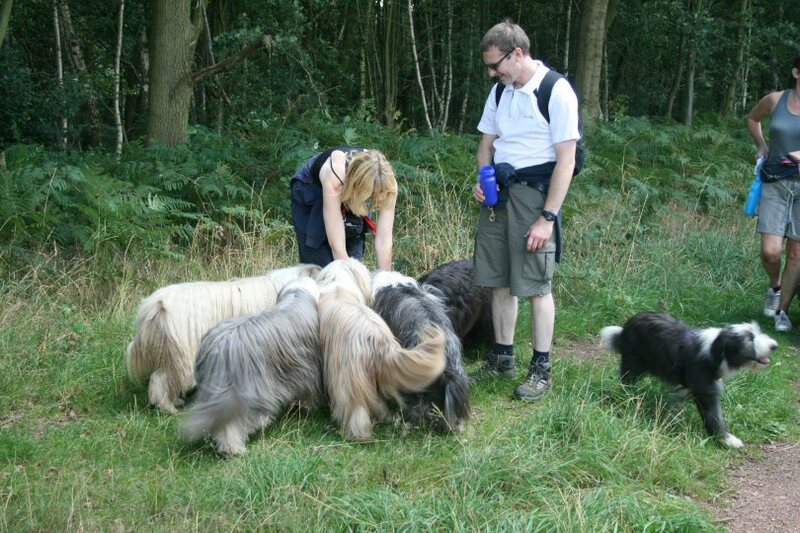 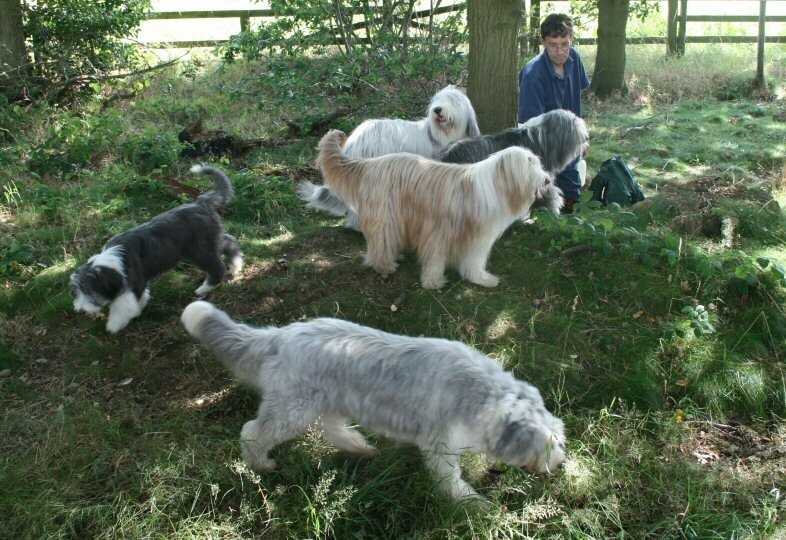 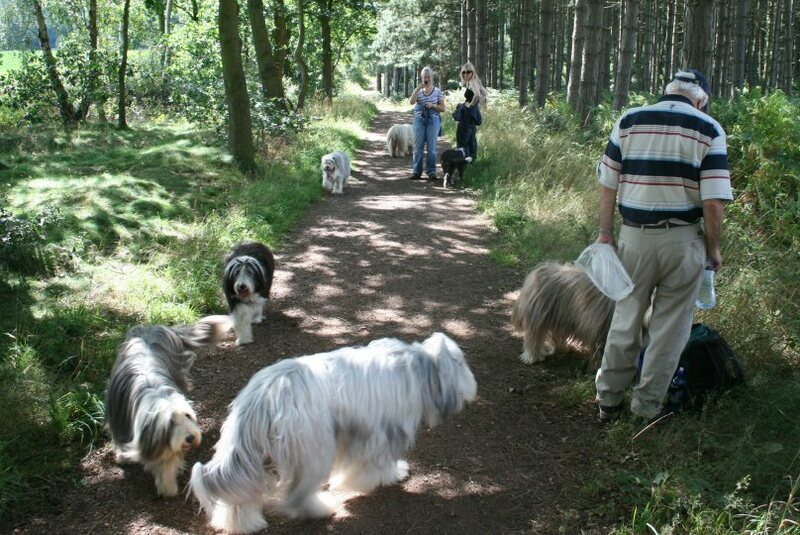 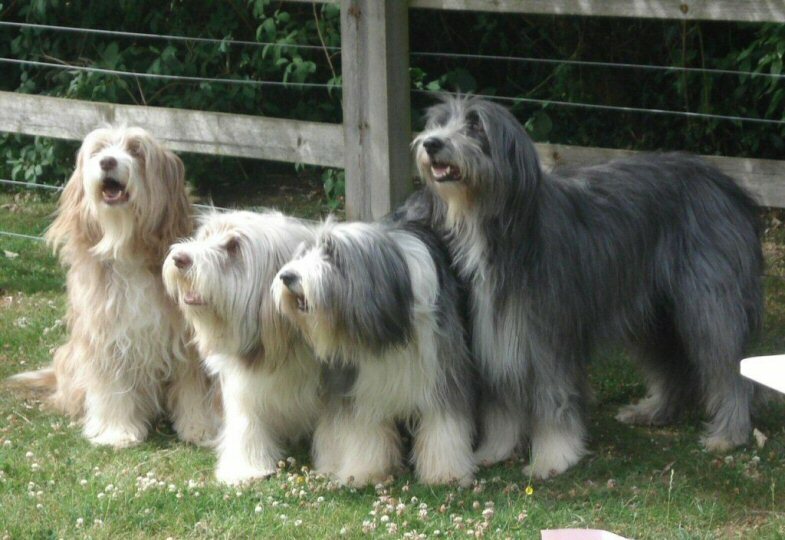 Our thanks to Liz Middleton for organising and leading a lovely walk for 18 beardie owners and their dogs from Old Clipstone on the edge of Sherwood Forest, along (and in!!) 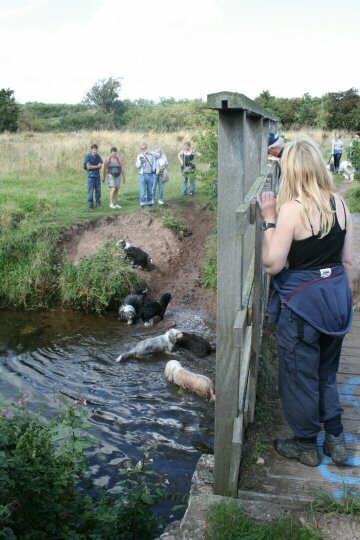 the River Maun to the village of Edwinstowe, then back through the forest to the Dog & Duck pub for refreshments. 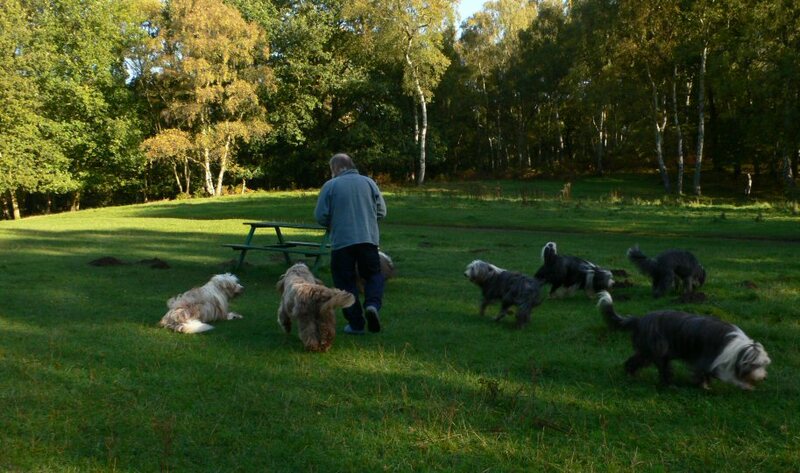 A hugely enjoyable afternoon. 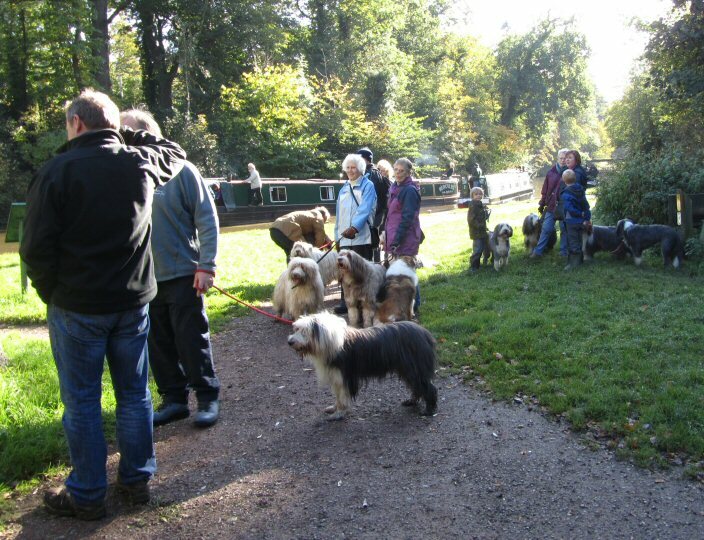 This was the fifth annual malvern ramble and the second to end up at a pub - in this case the very attractive Swan at Hanley Swan! 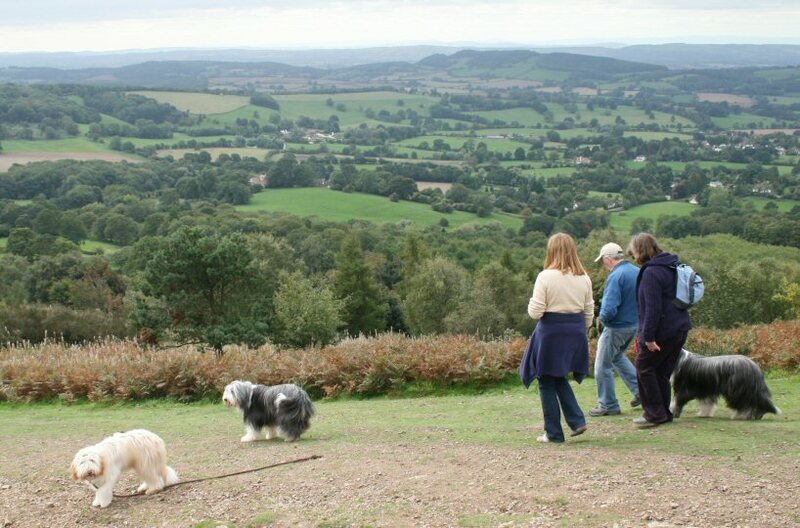 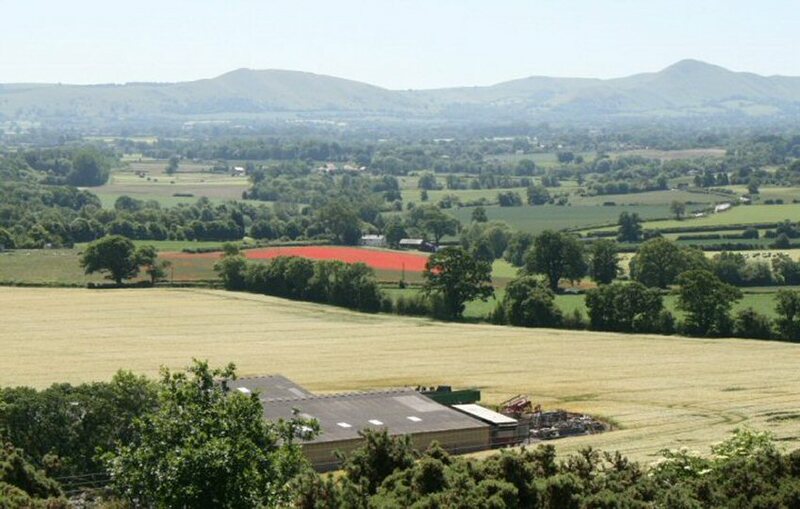 It was particularly good to see Cindy Sabin, back from the States for a holiday, with Philip, and it appeared to us that, like all who participated, she really enjoyed the occasion and those wonderful views out over west Worcestershire and Herefordshire. 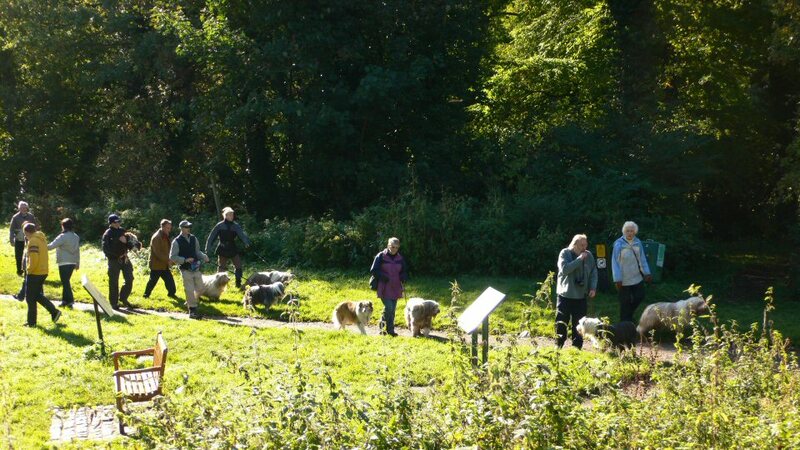 The weather (yet again) stayed fine throughout. 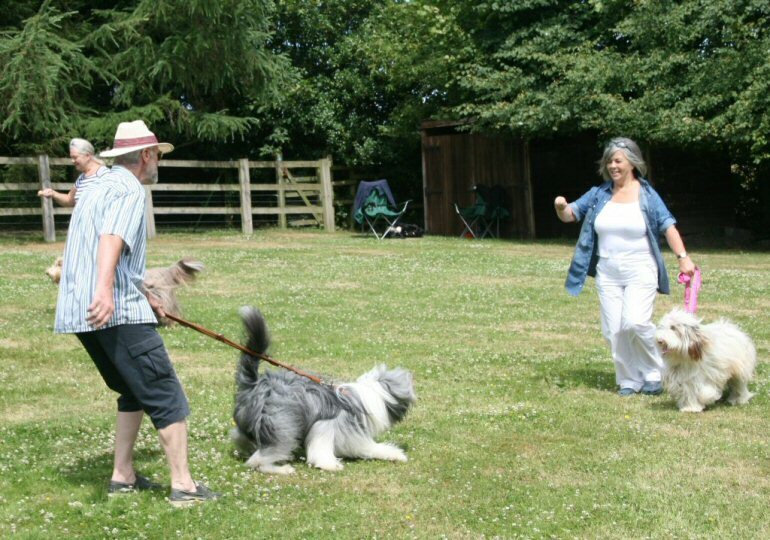 (Nearly) a full complement attended this year's Pentathlon at Twyning Green, kindly hosted of course by Janet Martineau. 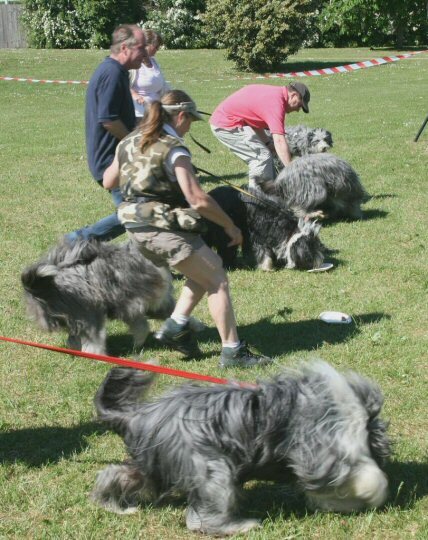 This photo shows the combatants - sorry, competitors! 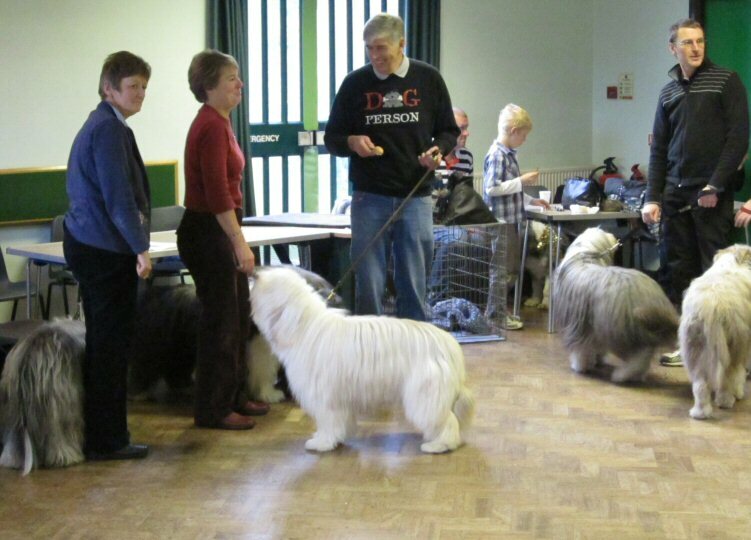 - at the close of the event, minus Anita Scott and Shady who had left by then. 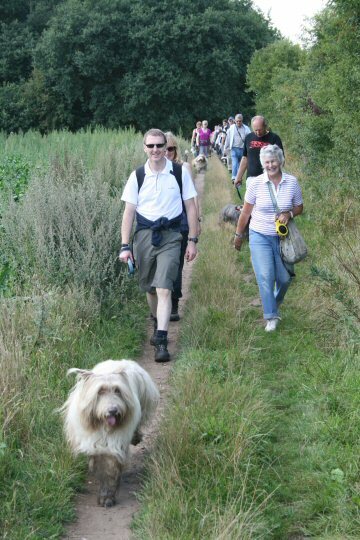 A repeat of the ramble walked first in 2008 but this time without the cloudburst! 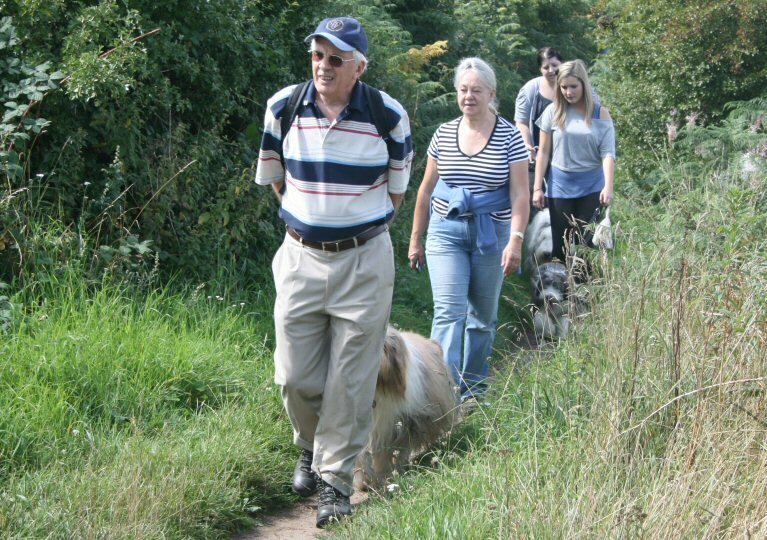 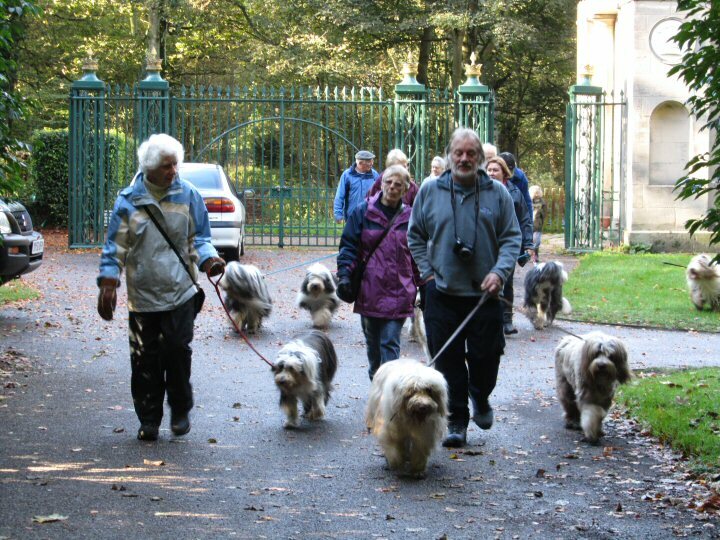 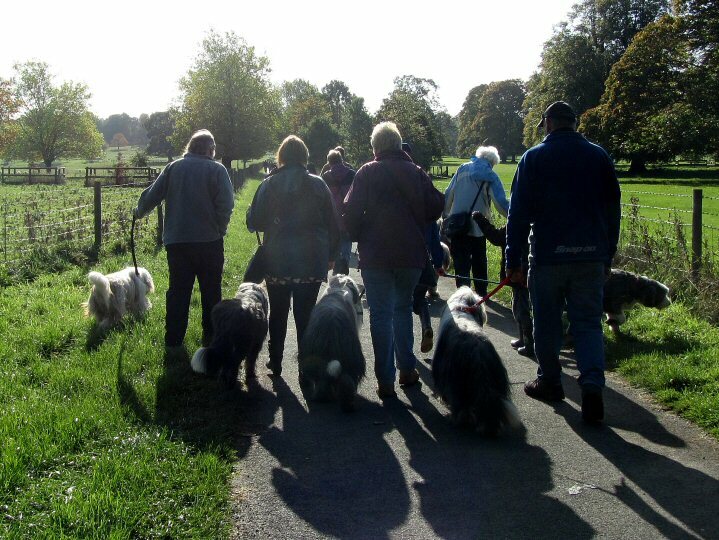 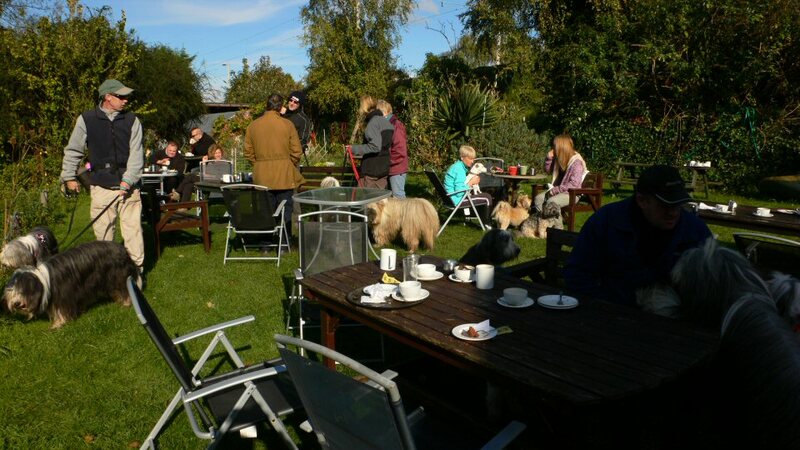 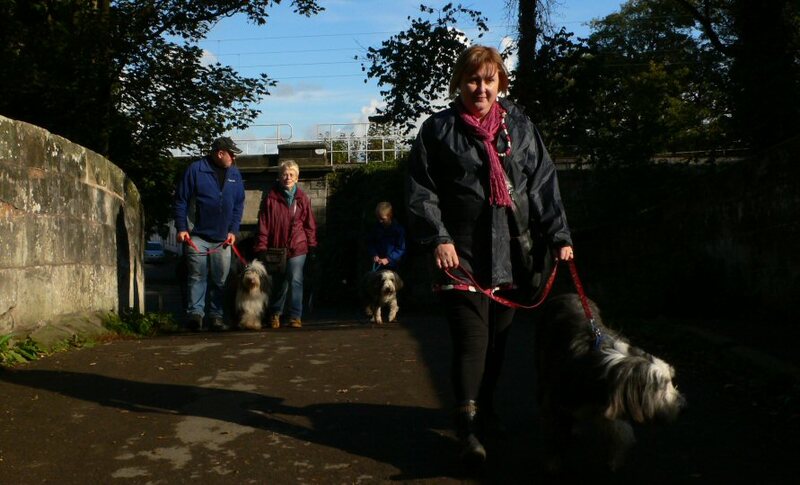 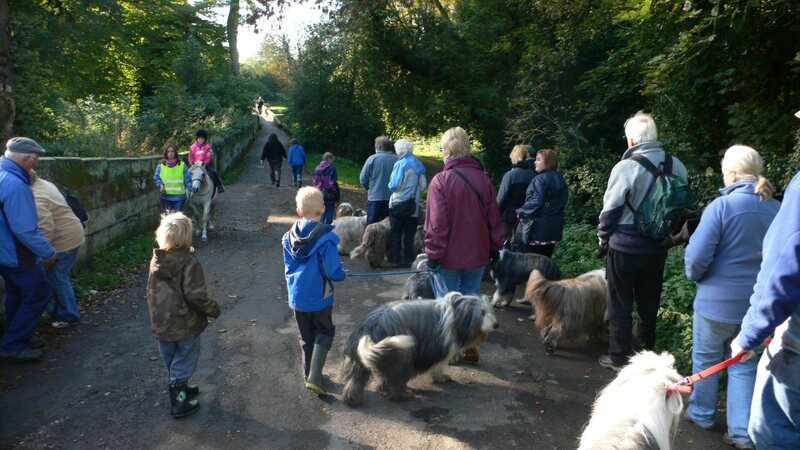 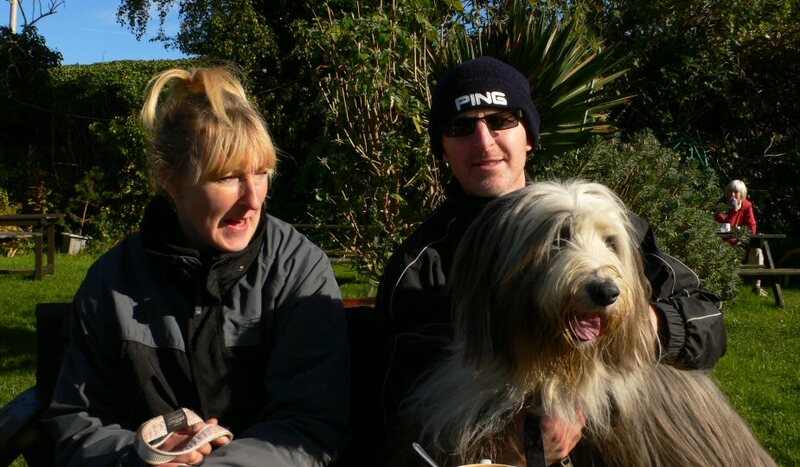 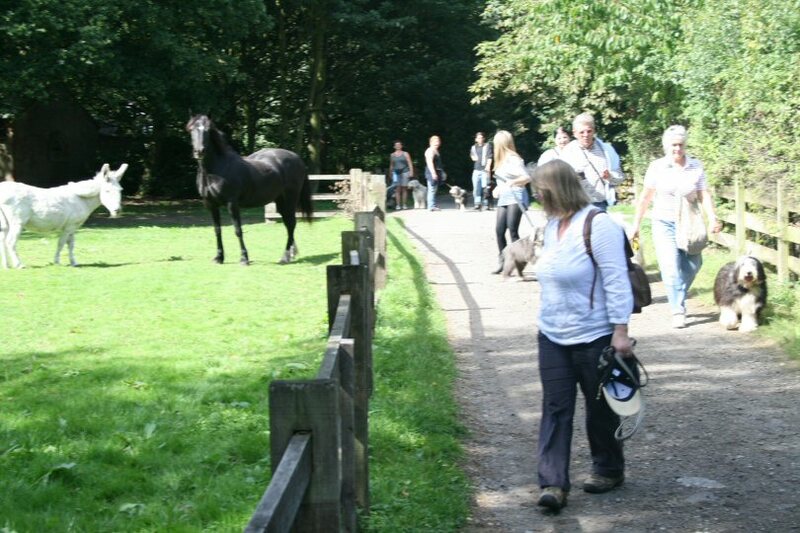 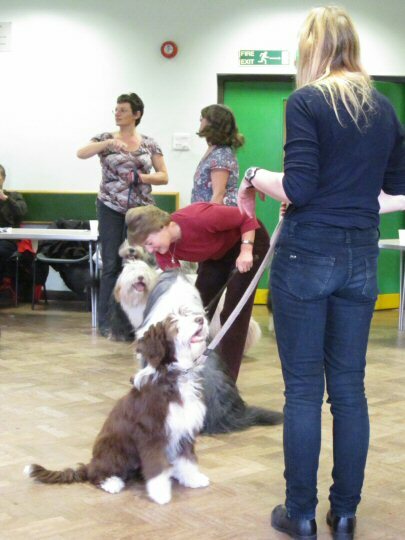 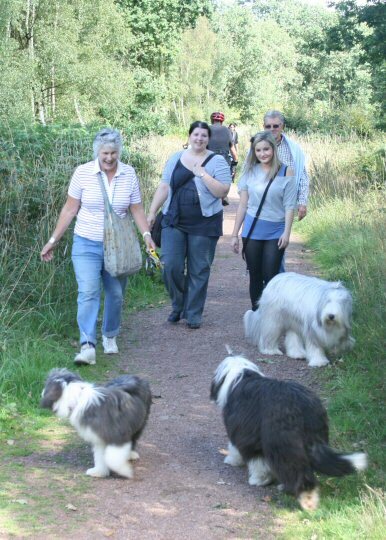 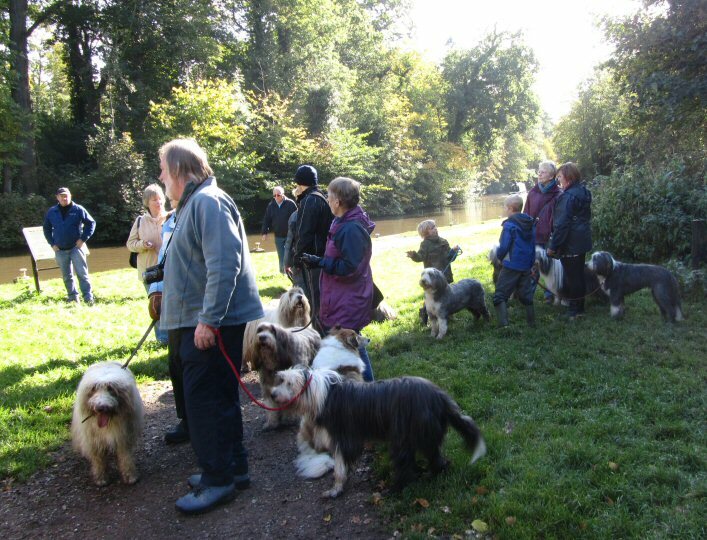 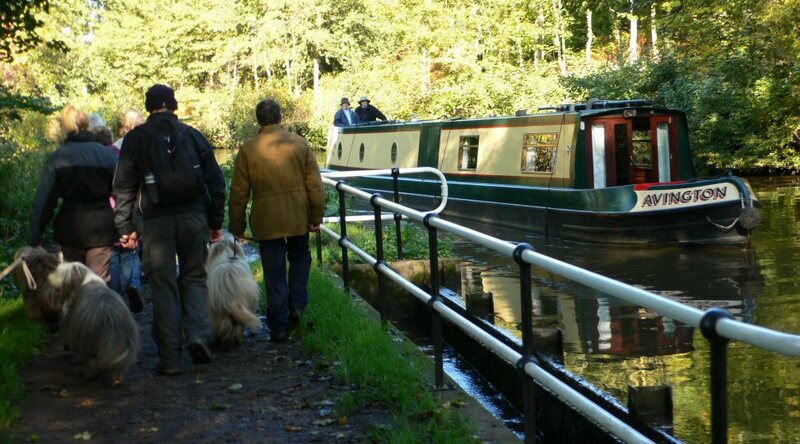 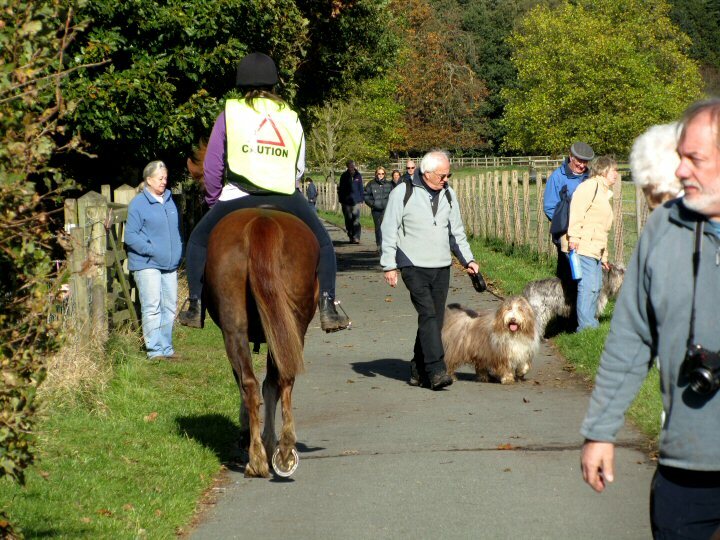 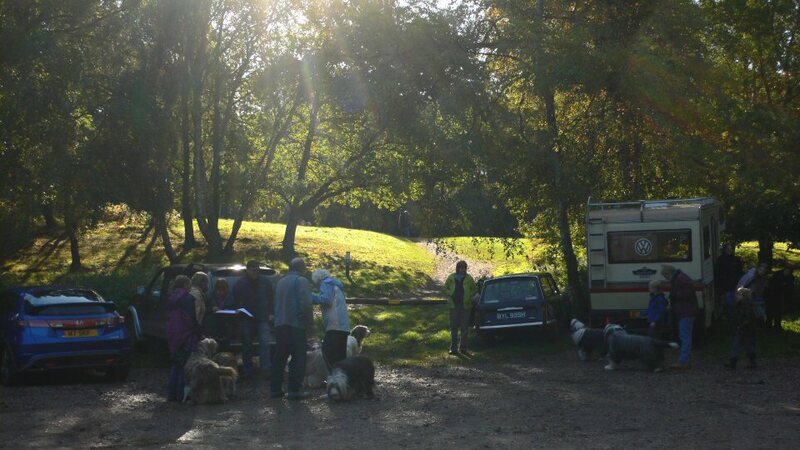 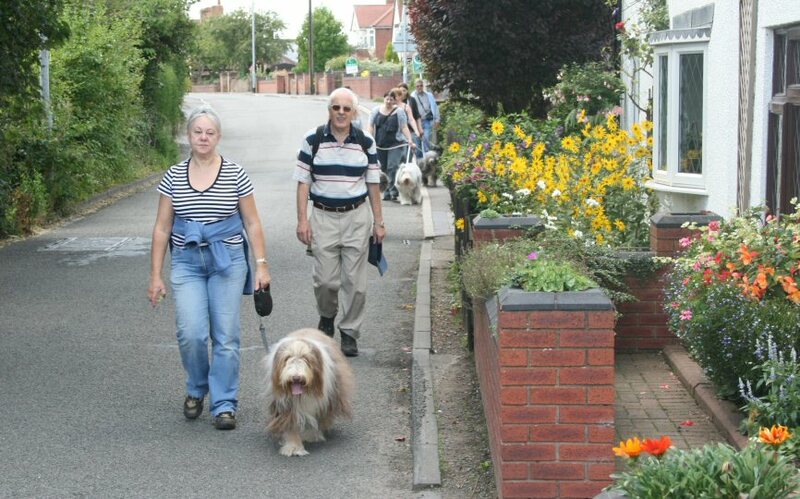 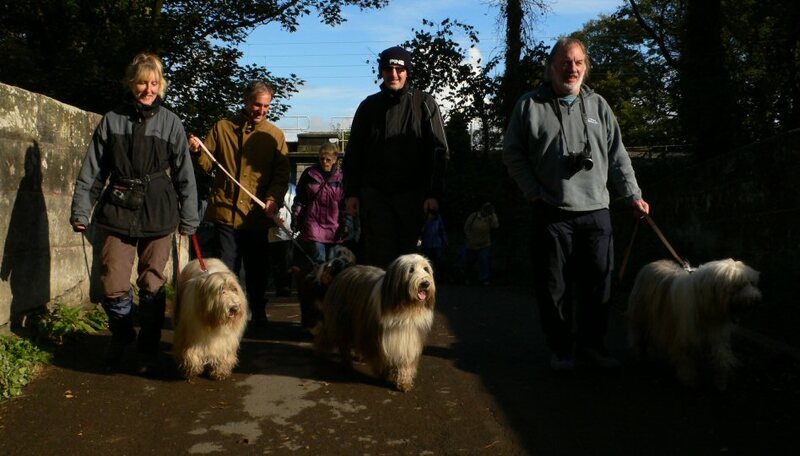 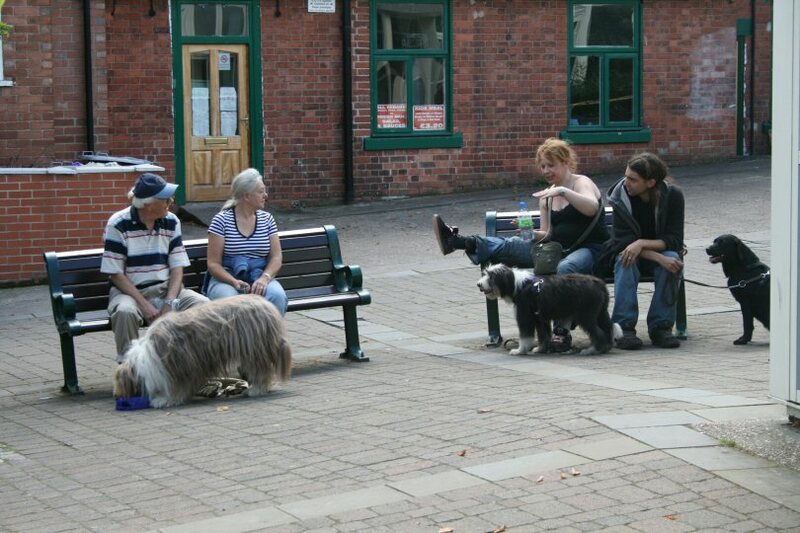 A gorgeous autumn day greeted the group of members and their dogs and the sun shone throughout. 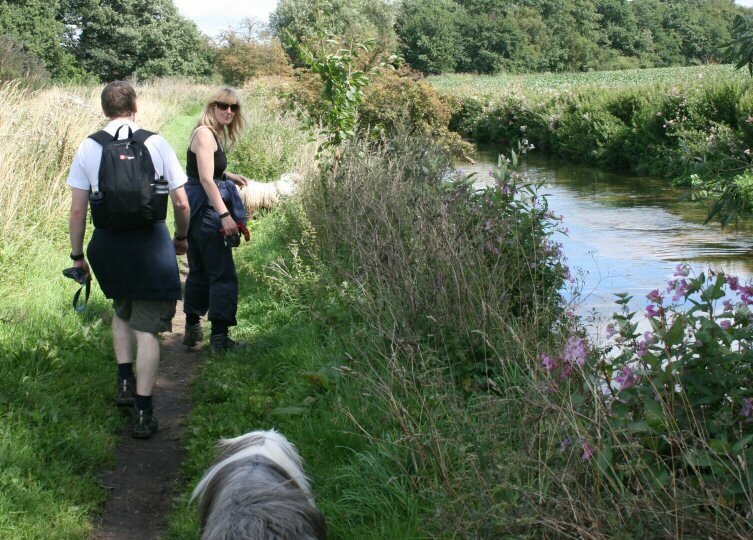 The walk combined lovely river, canal and parkland scenery. 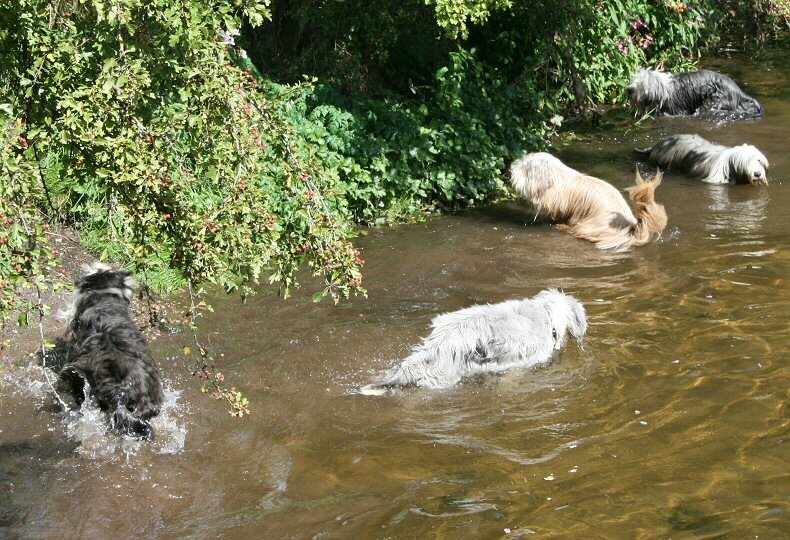 The beardies love the river bit, of course! 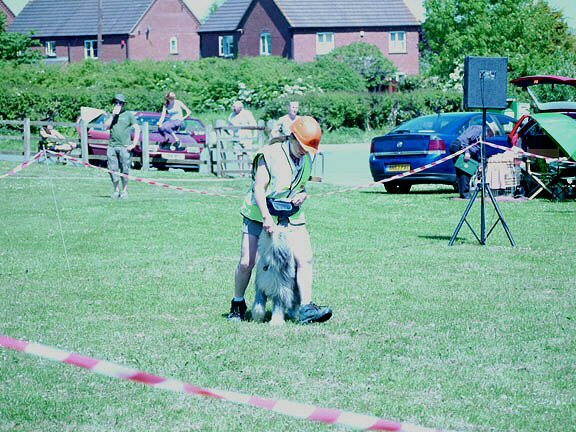 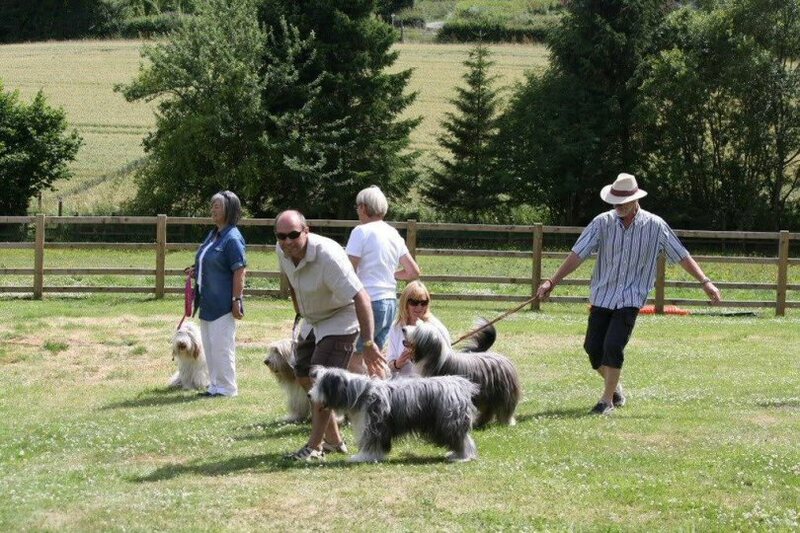 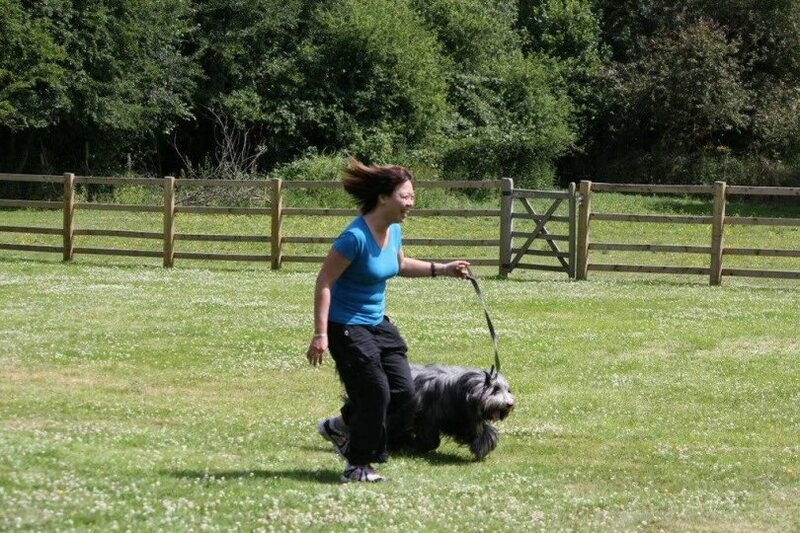 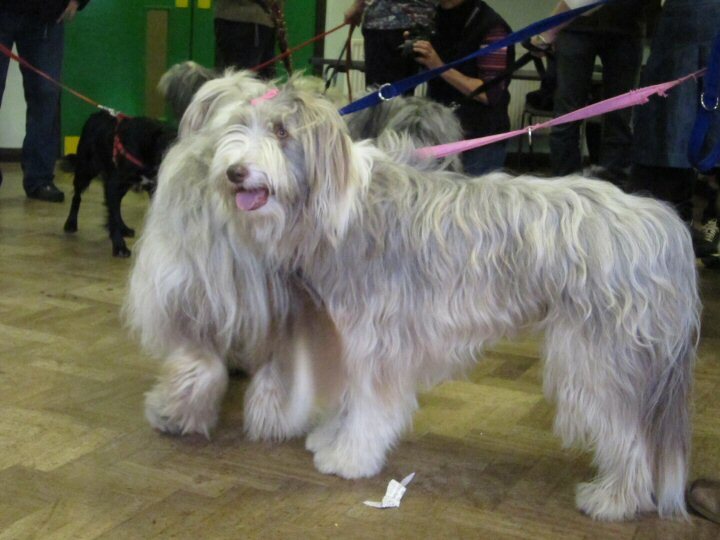 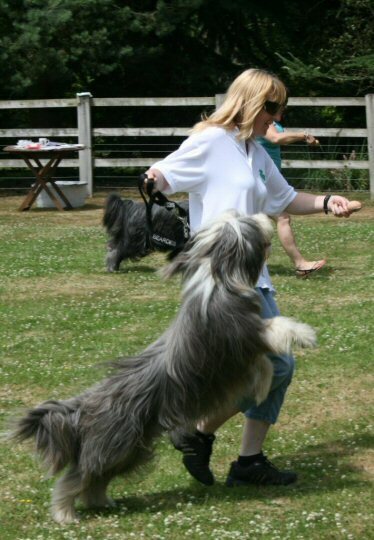 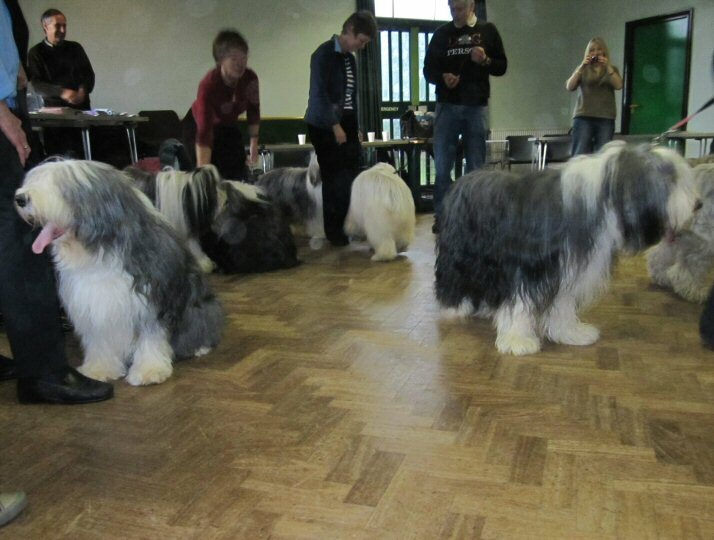 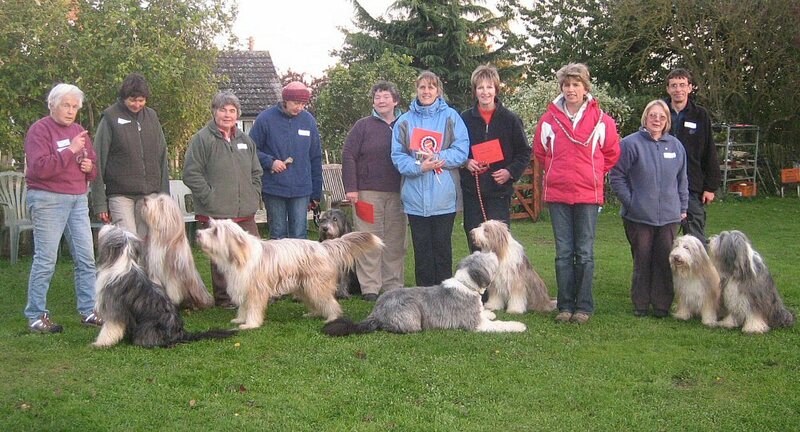 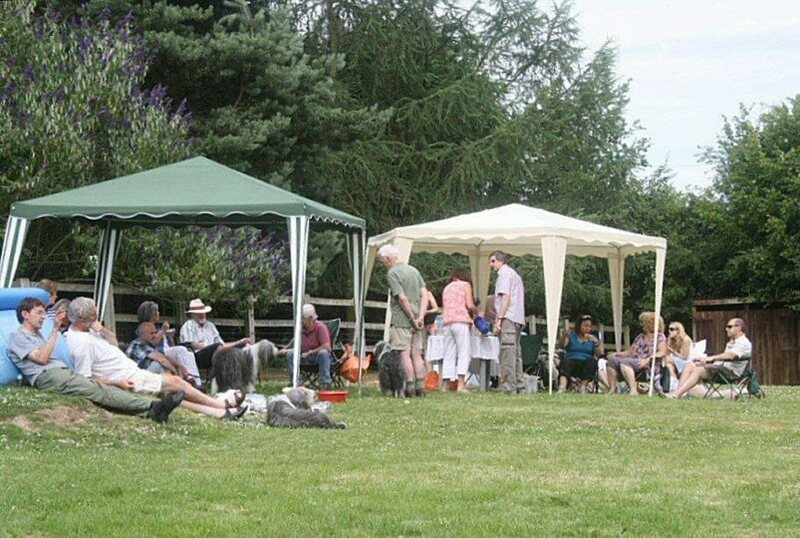 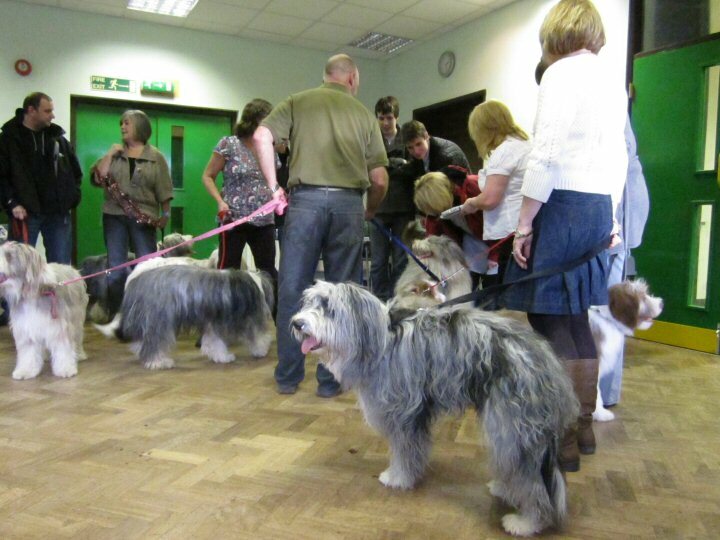 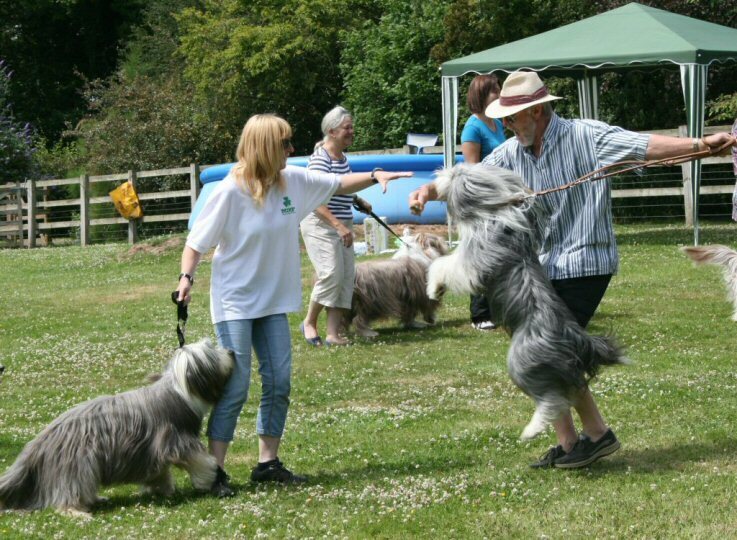 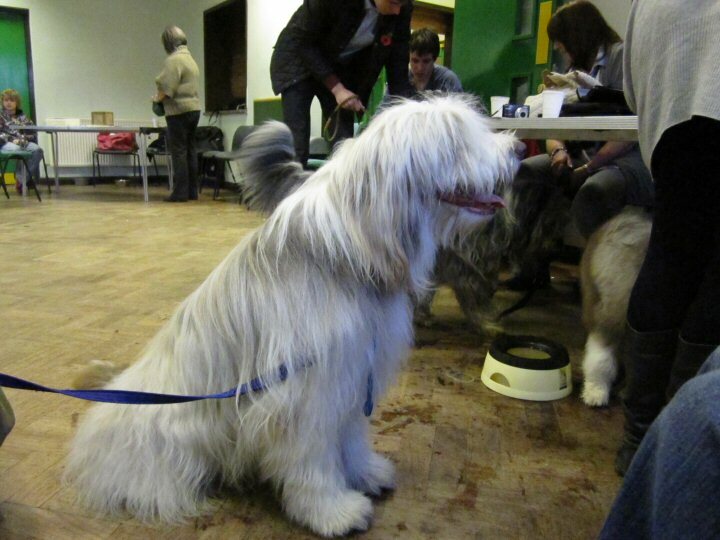 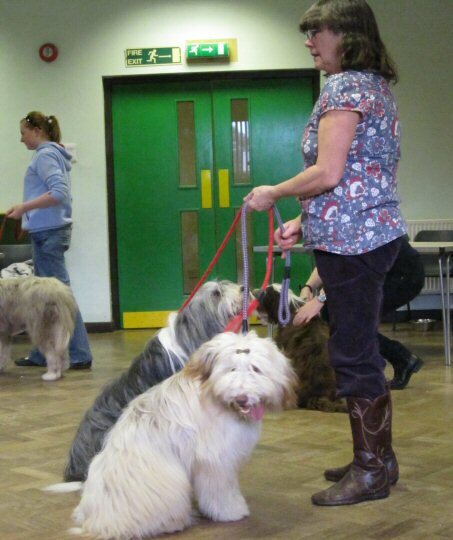 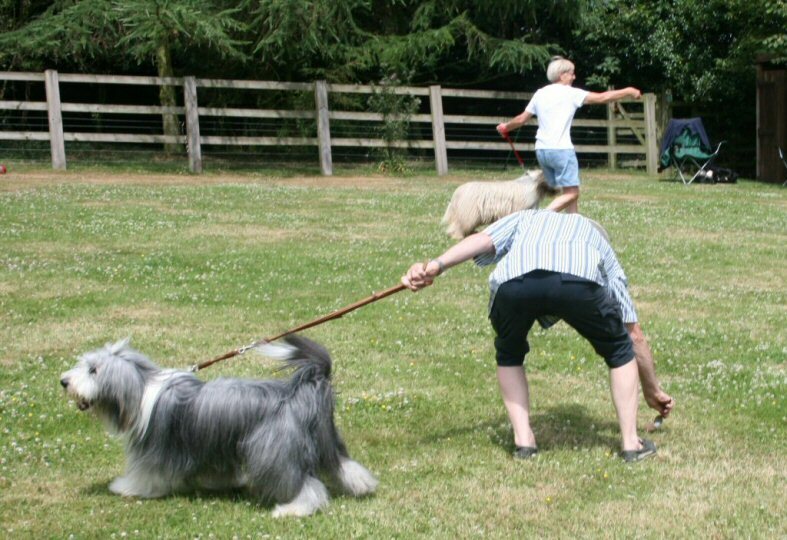 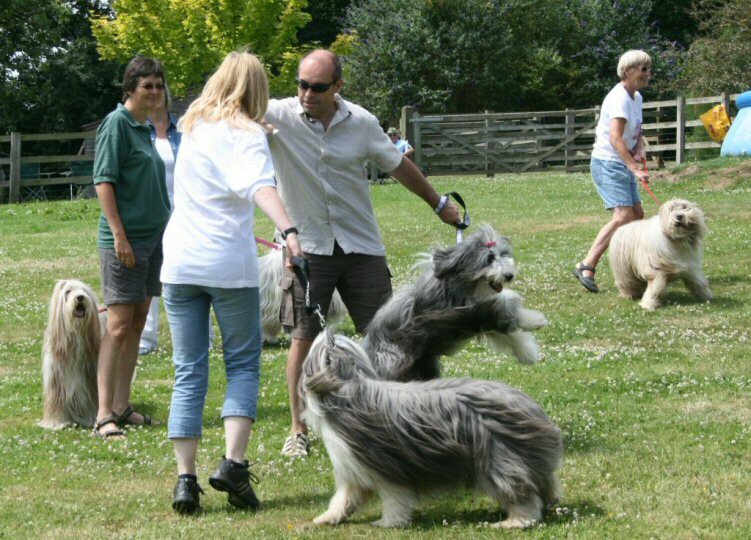 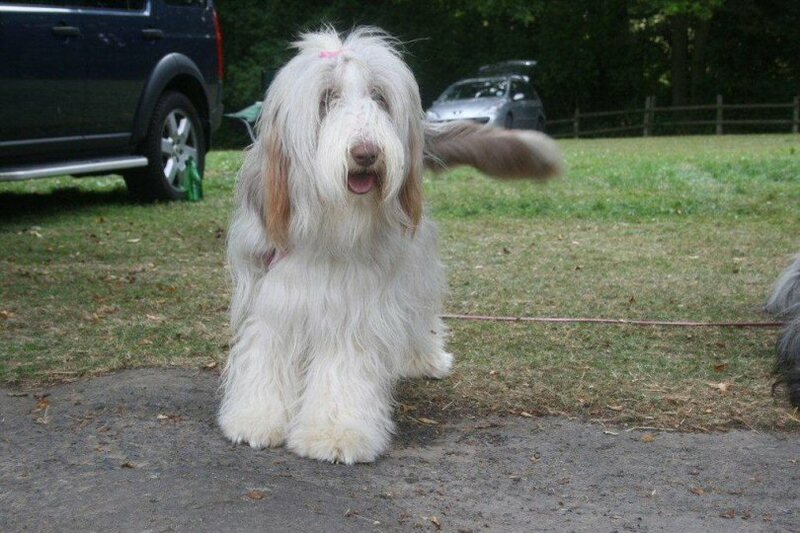 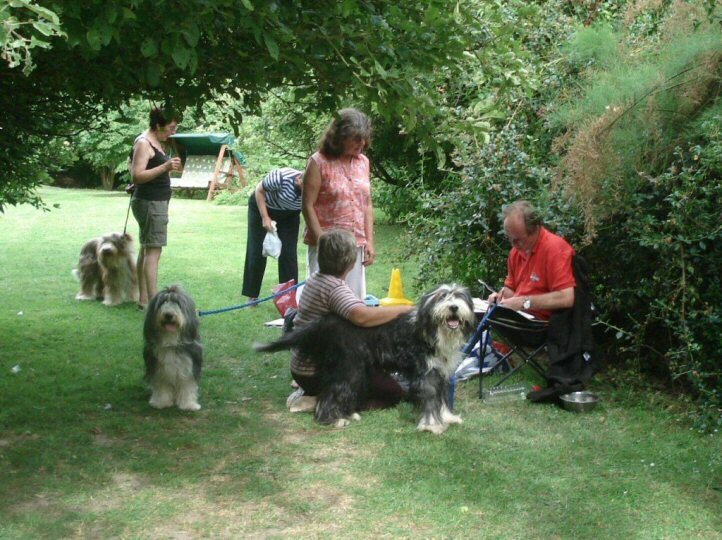 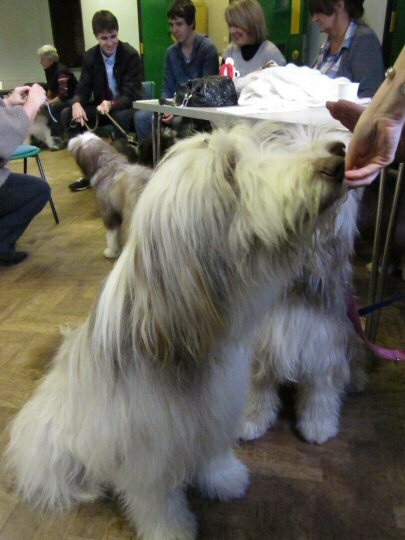 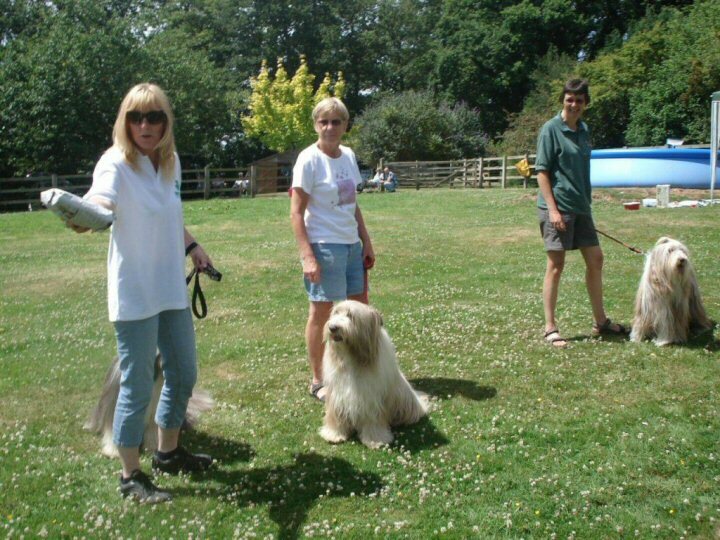 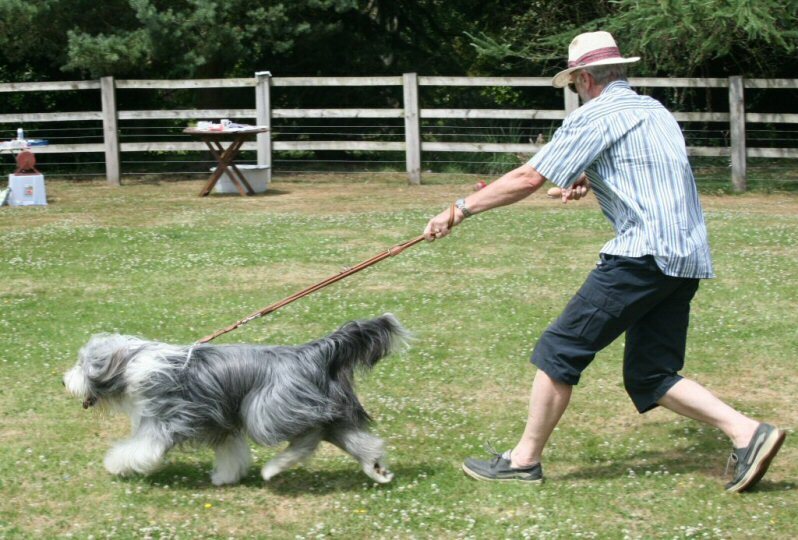 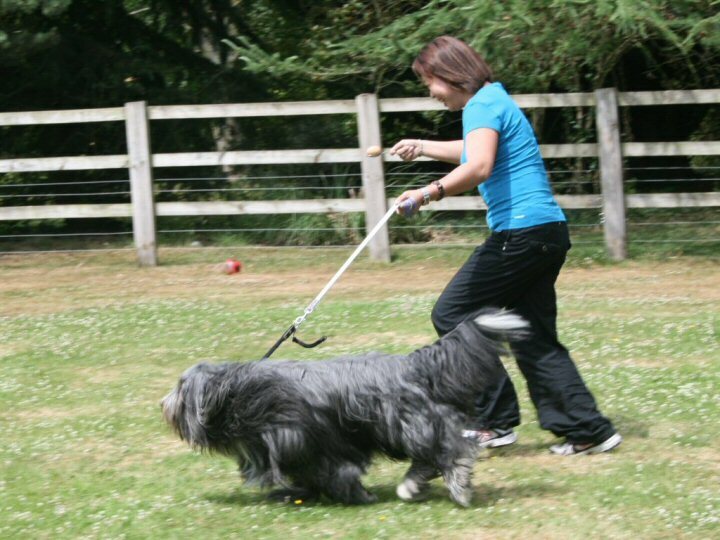 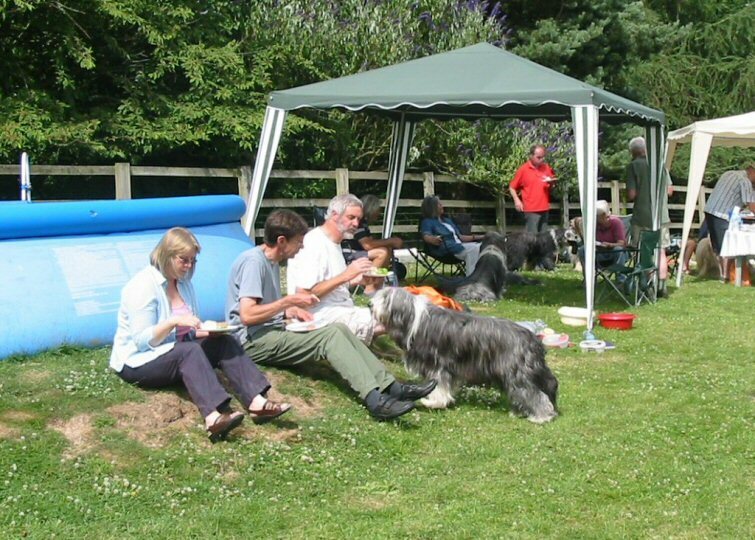 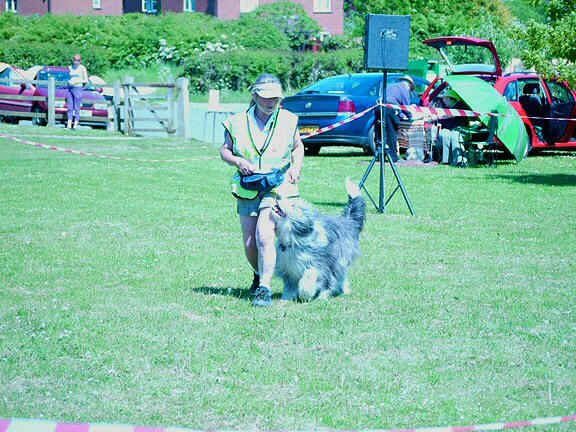 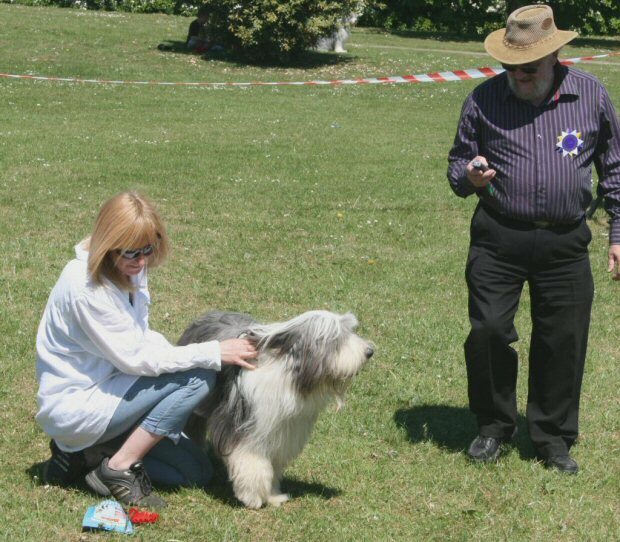 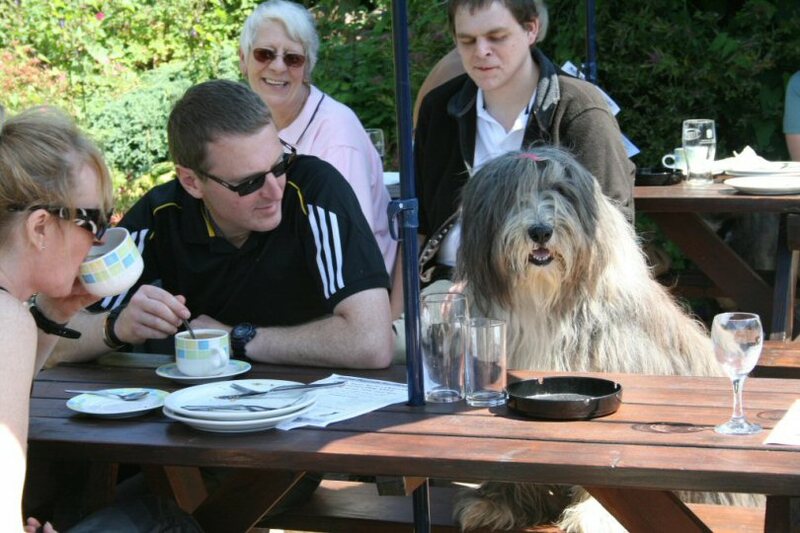 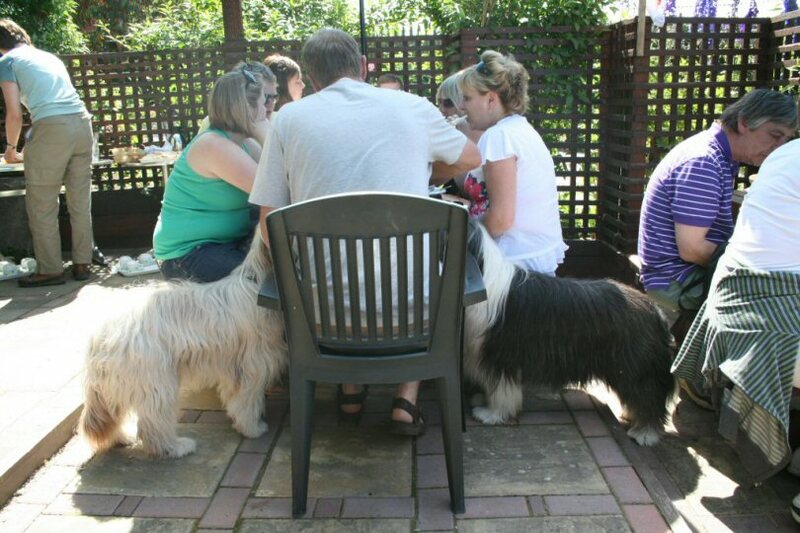 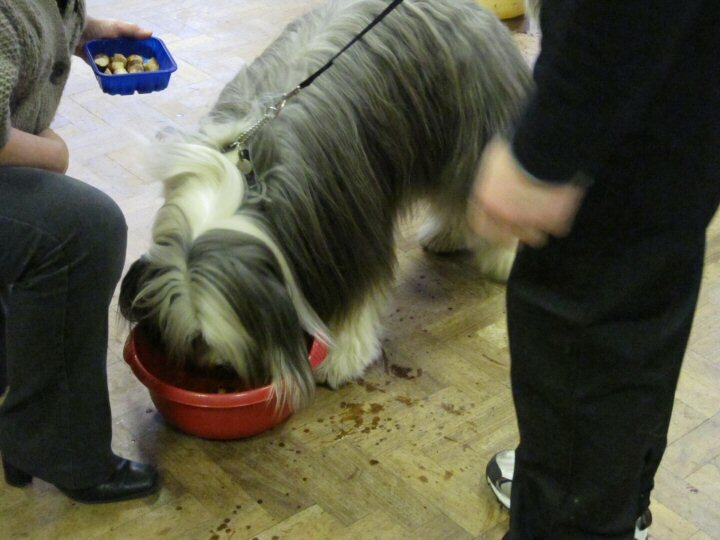 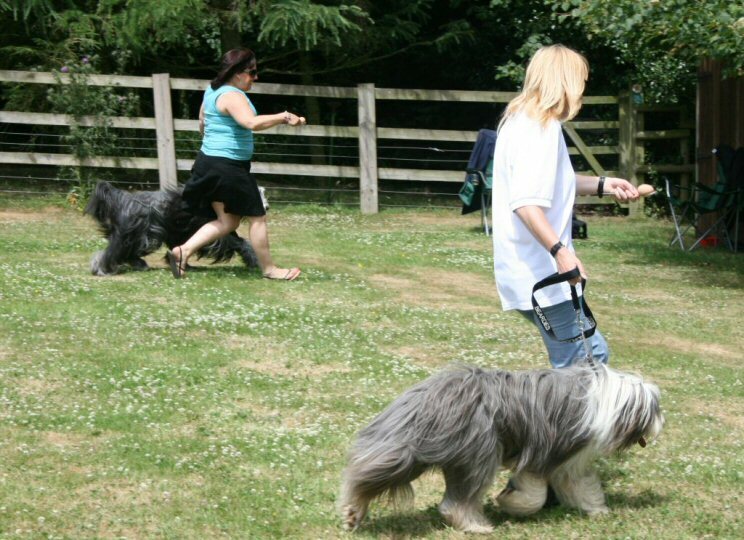 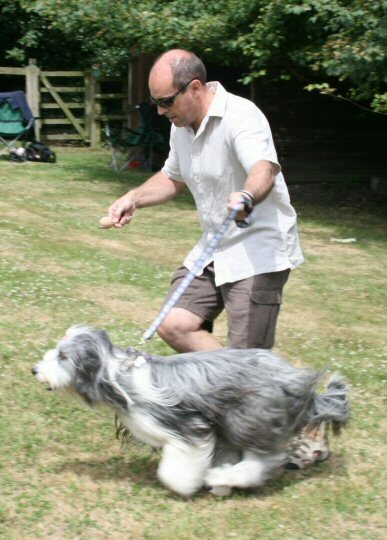 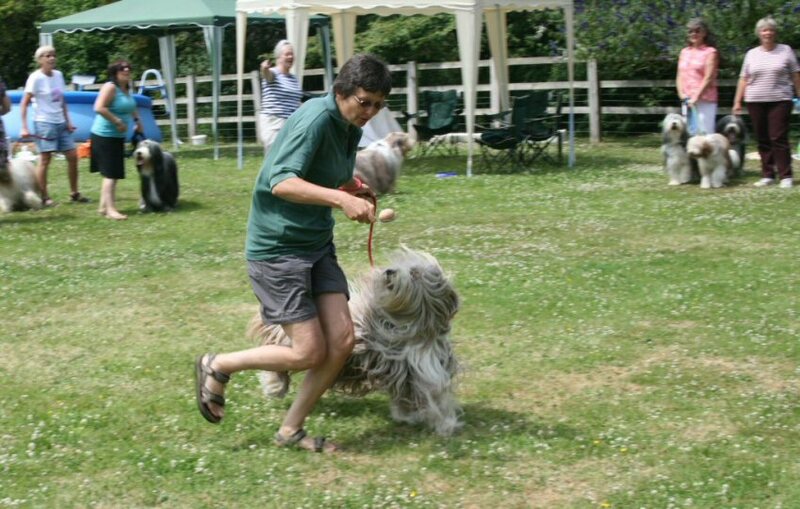 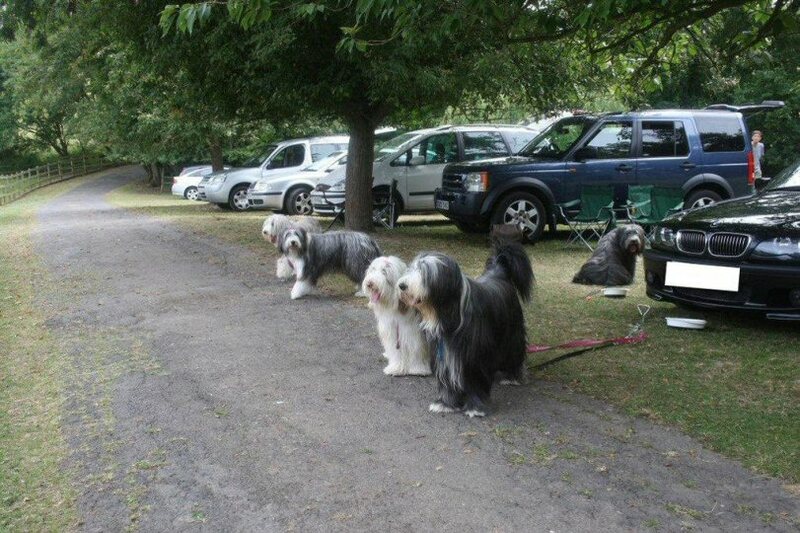 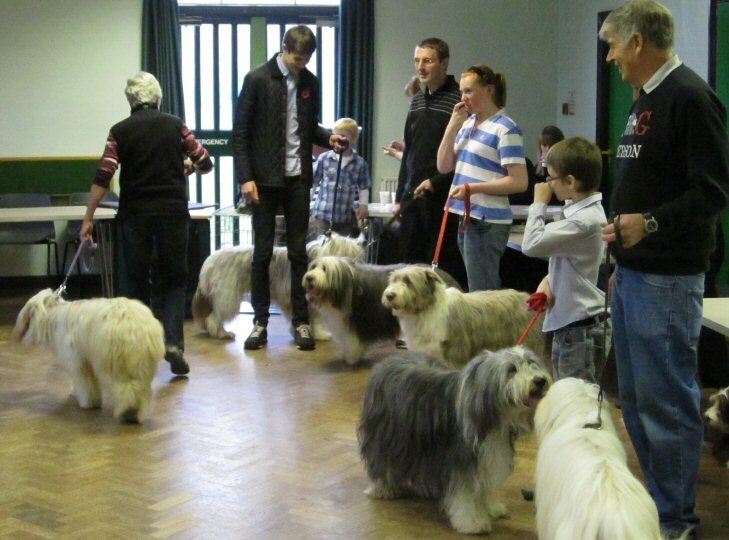 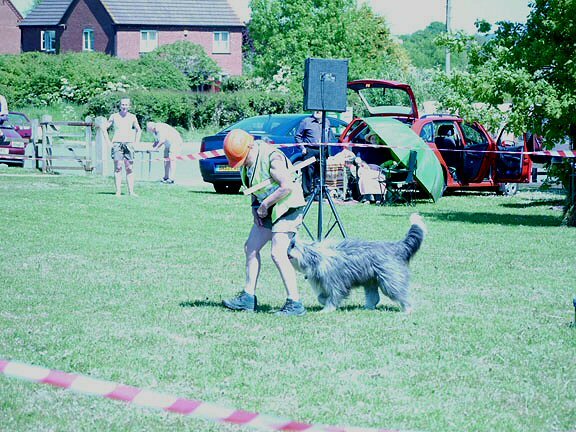 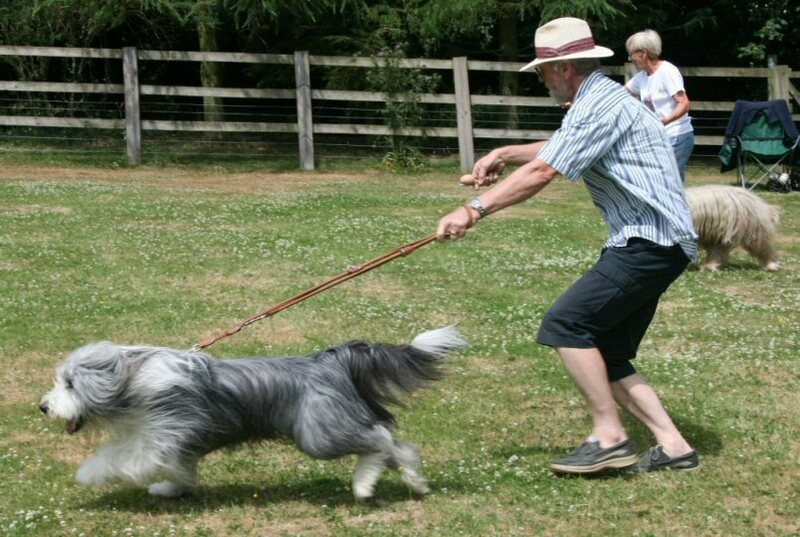 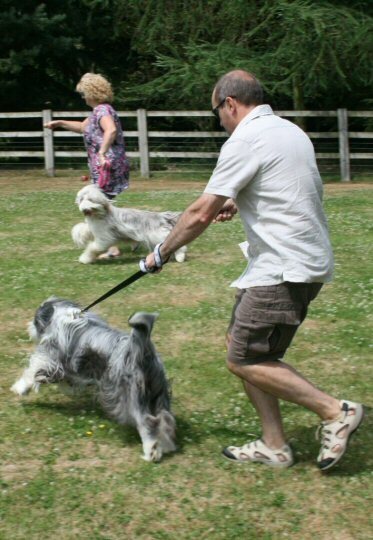 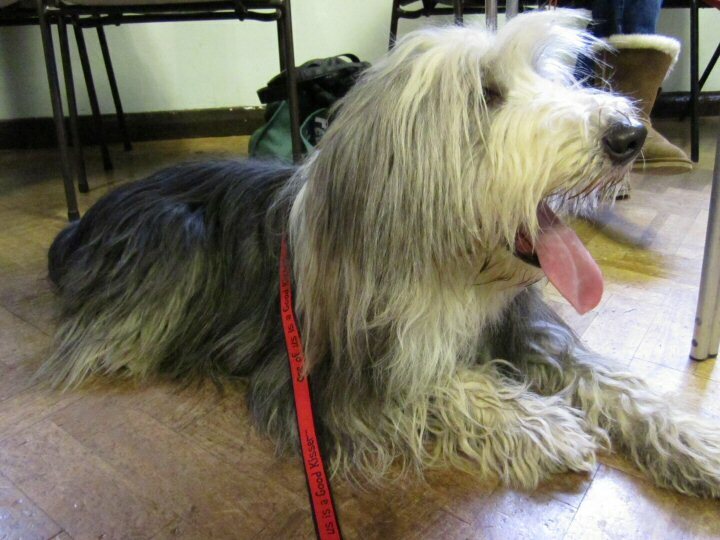 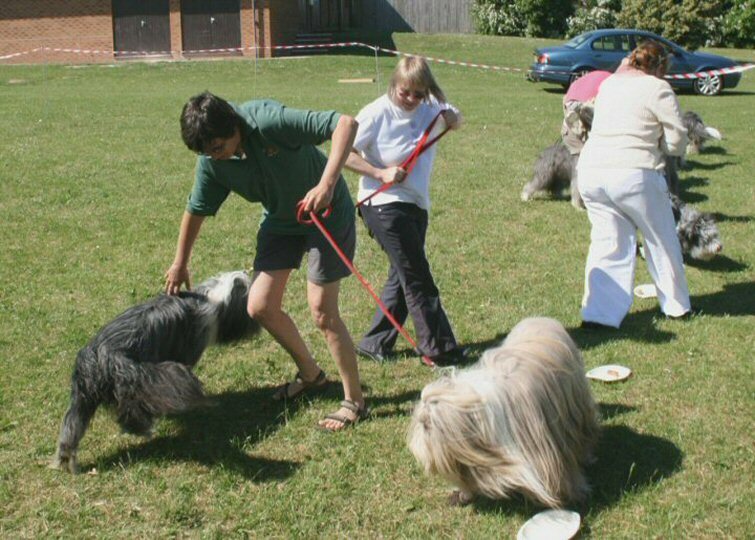 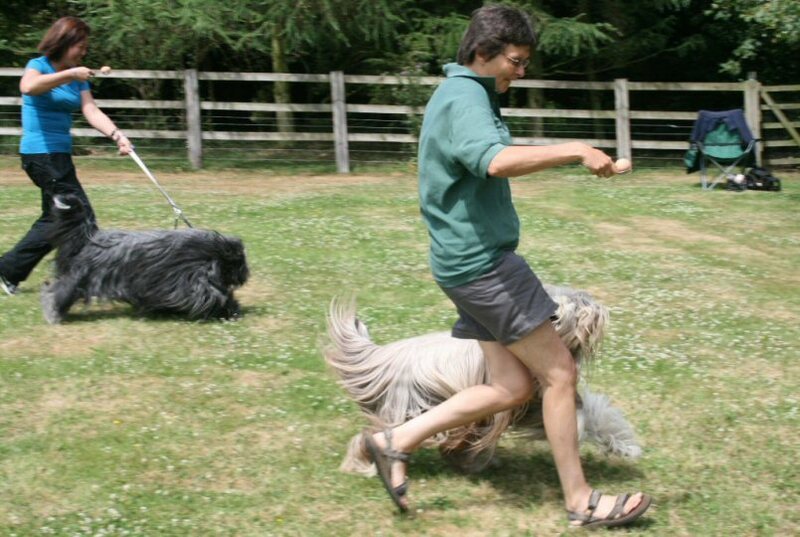 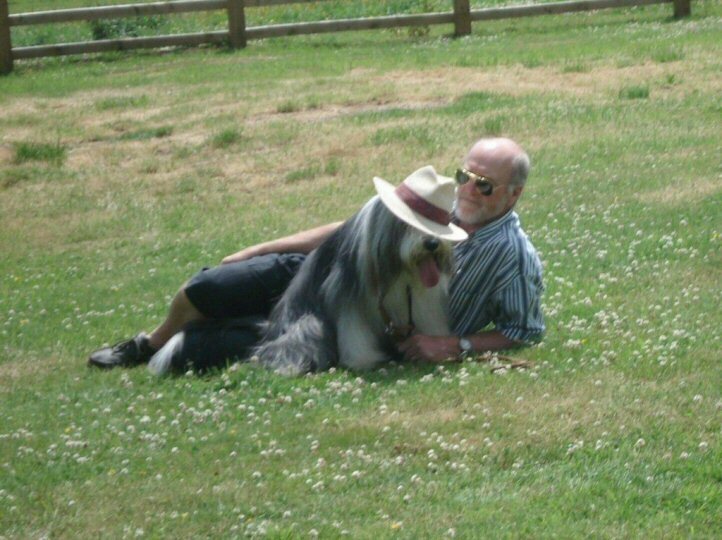 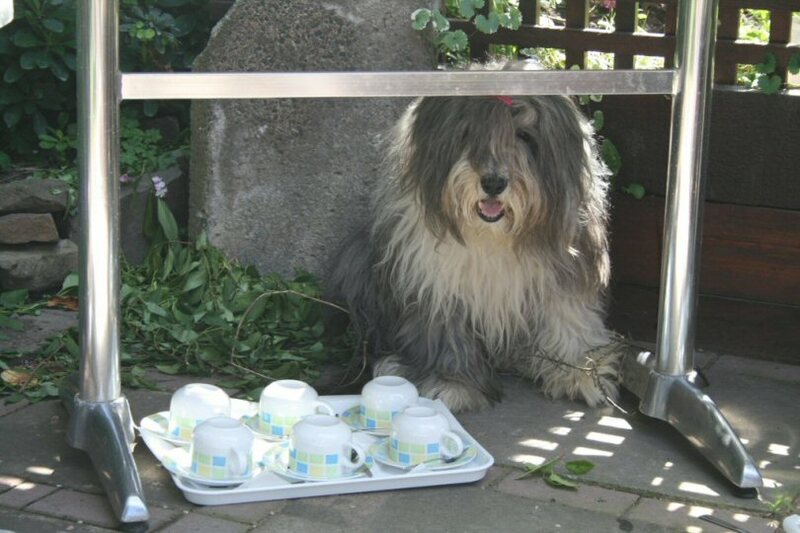 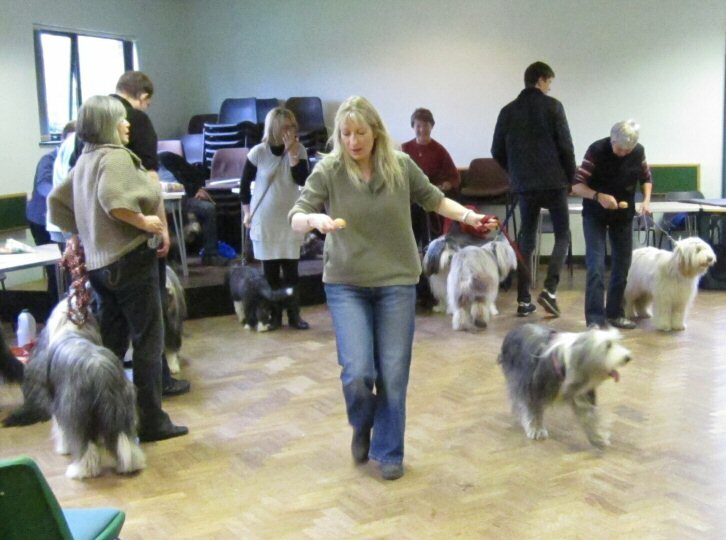 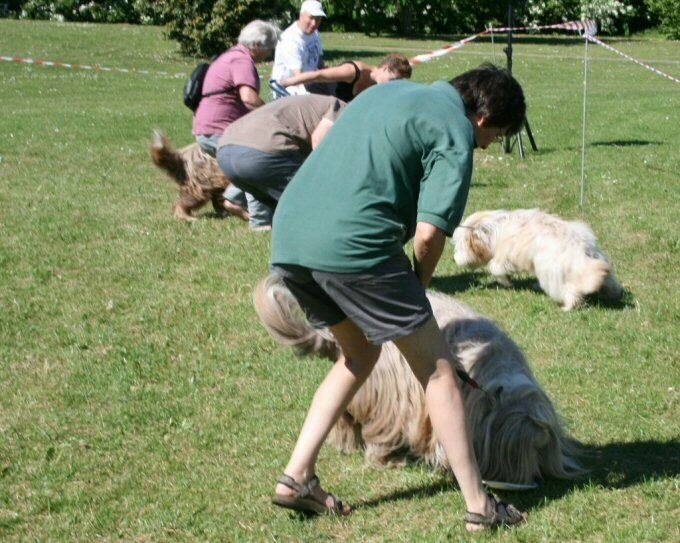 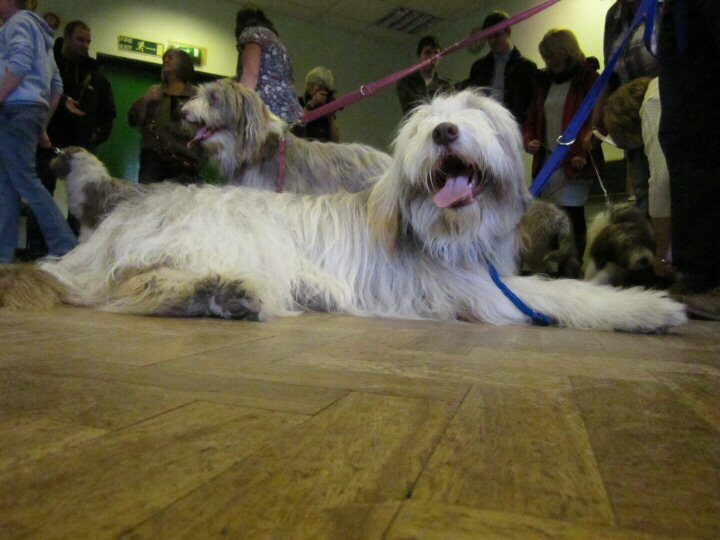 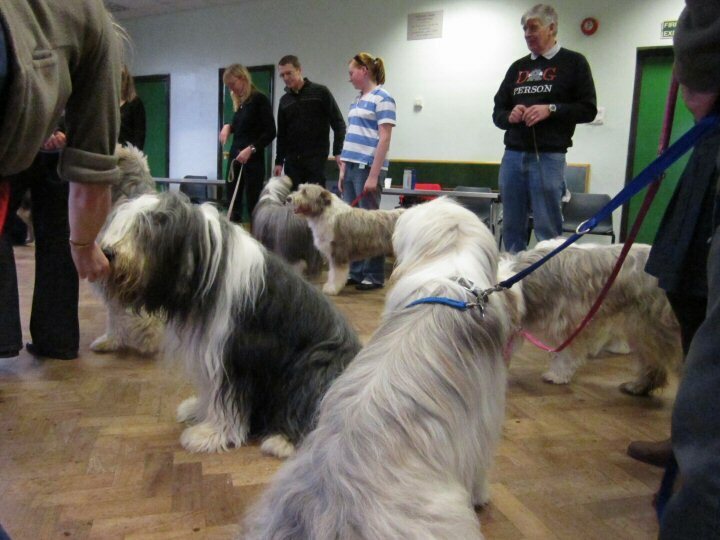 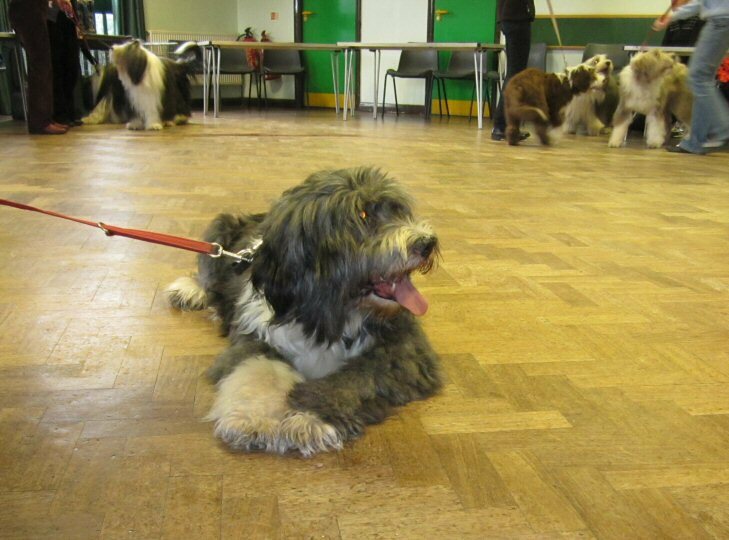 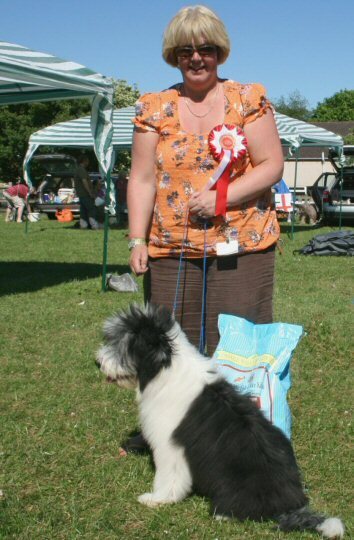 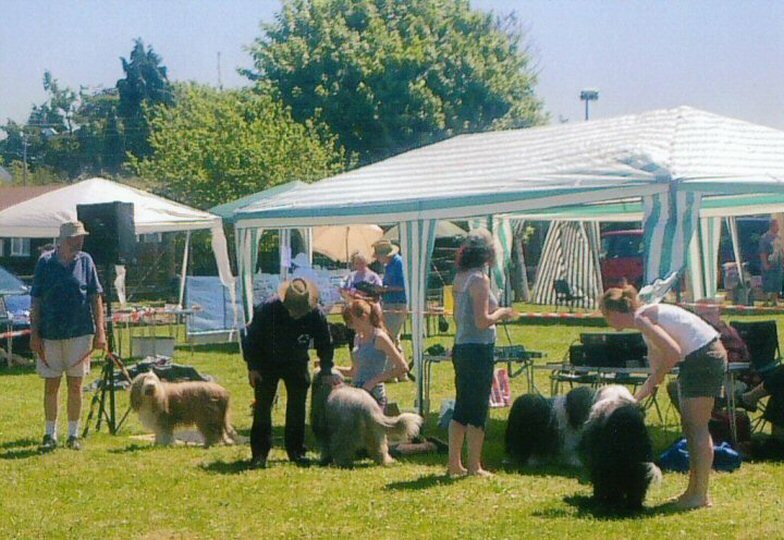 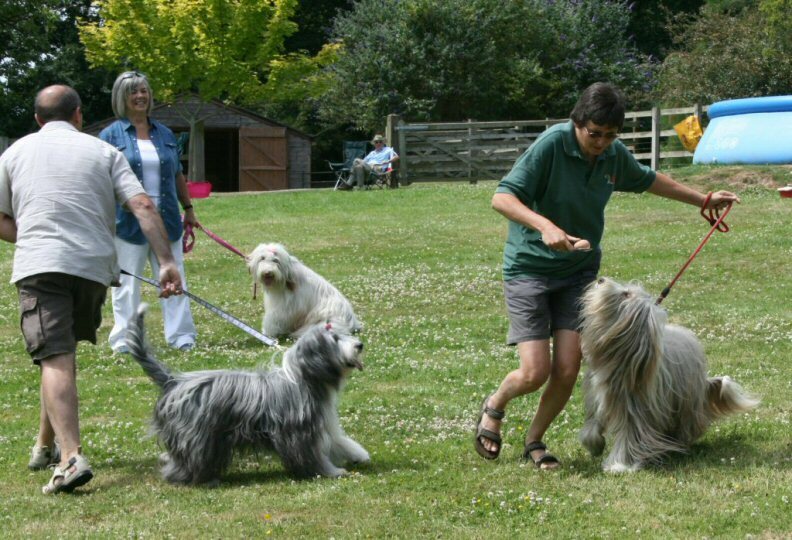 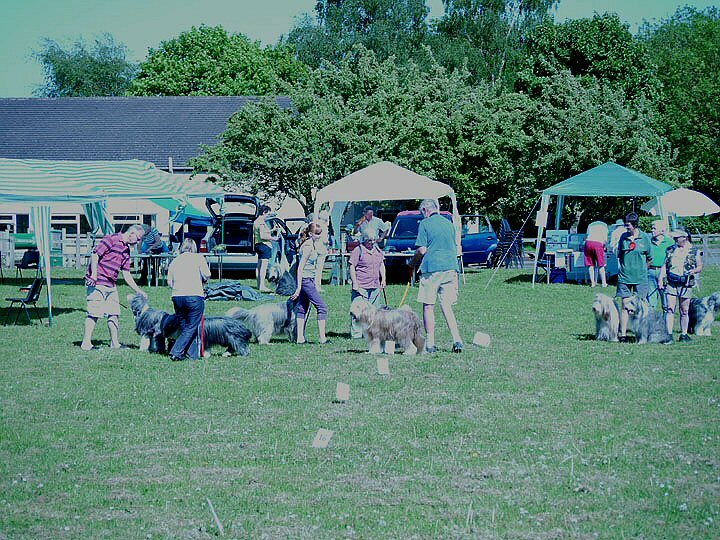 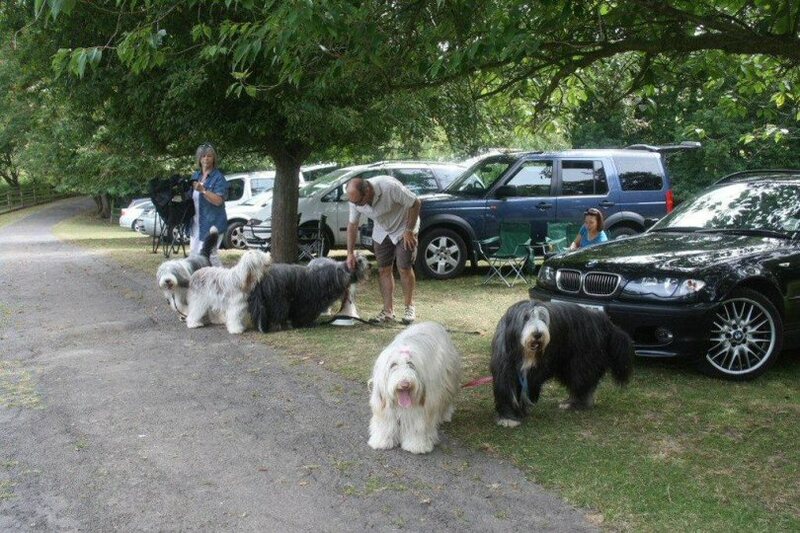 Around thirty beardies and their owners attended the fifth annual party at Cheswick Green and a good time was had by all. 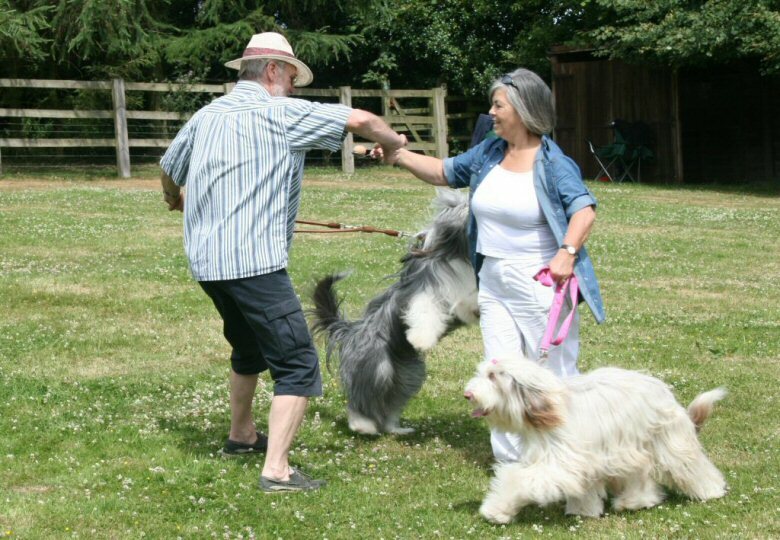 As in previous years, Pat Wincott's drive and enthusiasm made the event a success, as those who attended would doubtless agree. 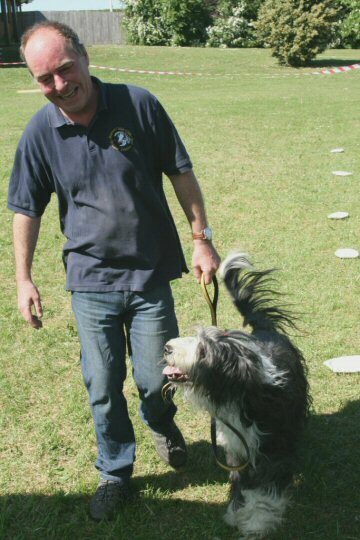 Thankyou from us all, Pat, for all your effort.